Of course everyone wants absolute road safety, but too often it seems that these laudable aims have been replaced with a desire to extract as much money as possible out of motorists or to make driving so unpleasant as to force motorists into feeling like second class citizens, intensely disliked but - for reasons of financial and political expediency - tolerated. So whilst most of this site looks at public transport options which will improve road safety by reducing the total amount of road traffic these pages promote positive solutions to improving road safety which do not rely on the nefarious principles of entrapment, extracting money from motorists' wallets or awarding them as many license (penalty) points as possible. Also looked at are other topical issues where sadly money grabbing also appears to have replaced sensible traffic management. 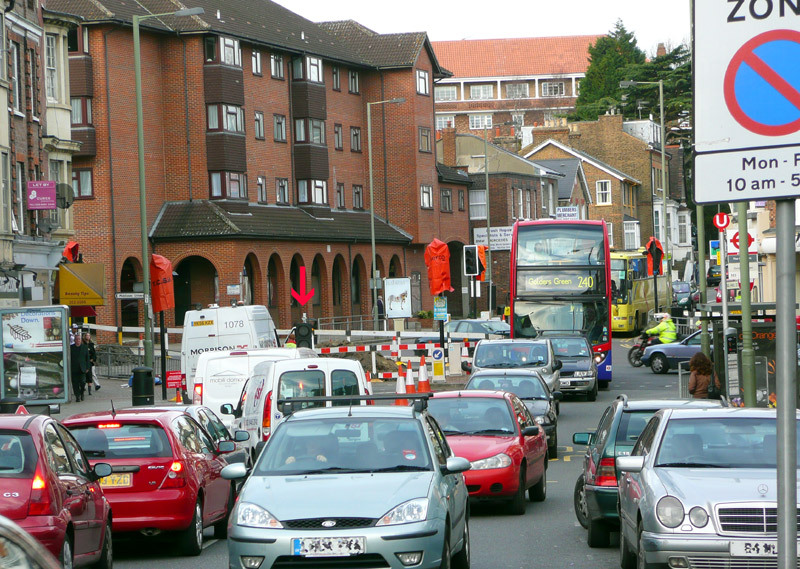 If 'Narrow' Roads Cause Congestion Can Wider Roads Cure It? High Occupancy Vehicle (HOV) Lanes. Skin Detecting Cameras / Occupant-based Variable Charge Road Pricing. Road Safety / Positive Actions to Improve Safety. 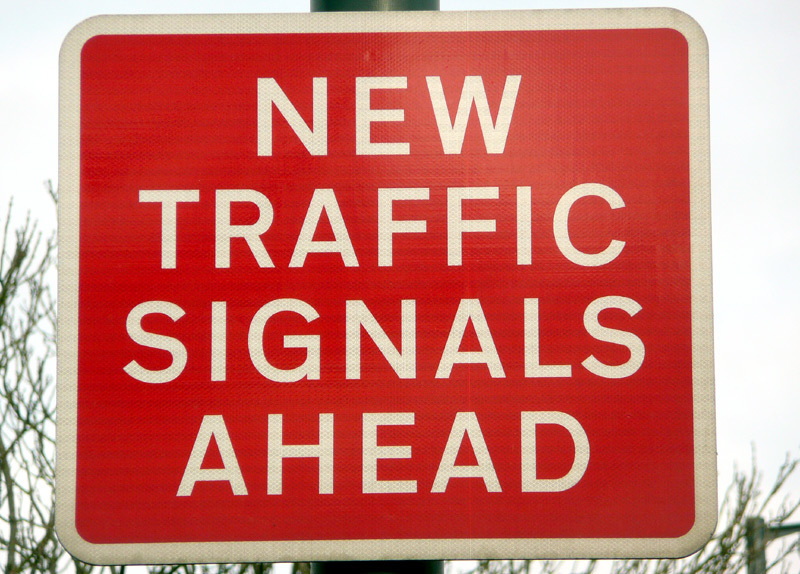 Just How Much L-o-n-g-e-r Before The (traffic) Lights (Finally) Change??? Traffic Calming & Driver Annoying. 'Signs Of The Times' - along with signs advising vehicle drivers of speed cameras (etc.,) road signs such as these are all too common on our roads. Can Wider Roads Cure It? 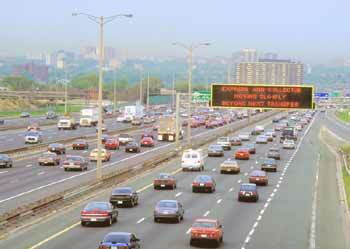 Early morning rush hour traffic on the (road name unknown) in Toronto, Canada. In Britain we do not have any roads as wide as this (13 lanes in total) - although parts of the M25 London Orbital Motorway have recently been widened to almost this size - and we can be assured that within just a few years of opening in this format the sections involved will start to experience congestion - yet again! Apart from road works and accidents the principal cause of traffic congestion is too much traffic trying to use not enough road space. 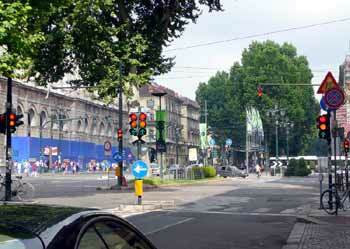 In the past a combination of road widening and building new roads were seen as the solution to traffic congestion. But now experience has shown that usually this will only provide short-term relief before the extra road space has attracted so much extra traffic that the roads become as congested as before. To accommodate all this new traffic the logical next step would be to build / widen yet more roads -- but that would simply be starting the whole crazy cycle yet again! Many people now agree that if we cannot build ourselves out of trouble then the only equitable and sustainable way we will reduce the amount of traffic using the roads will be by improving the alternatives (ie: public transport) and adopting land use policies which reduce the need for travel. To avoid duplication these subjects are more fully covered on the Enough Stick, How About Some Carrot page. 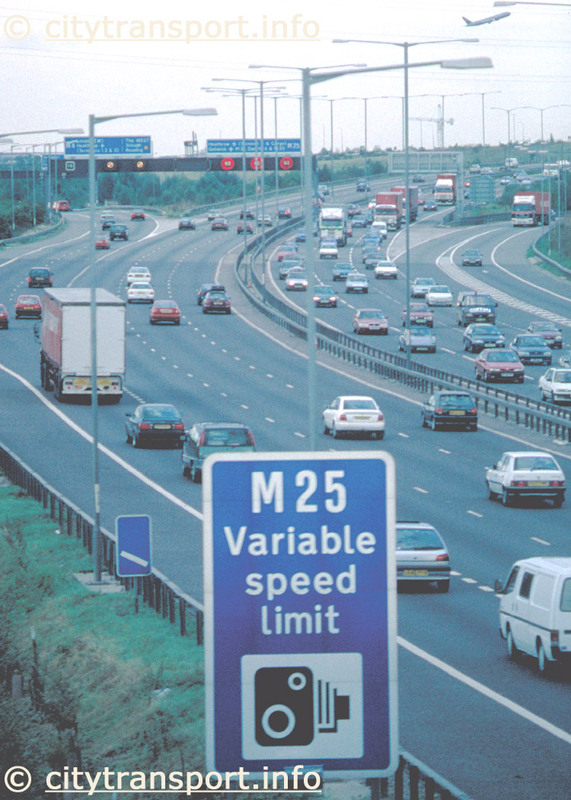 Variable speed control as used on the west and south-west sections of the M25. In an attempt to squeeze extra traffic onto already congested roads some of our busiest motorways have variable speed limits whereby the speed limit is automatically reduced whenever the road starts to become congested. 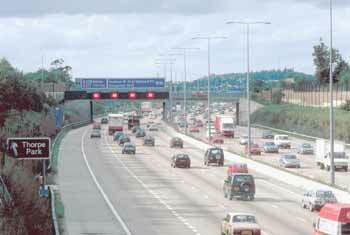 The limits are enforced by speed-trap cameras located above each lane on the overhead gantries. After a few years experience research has shown that this system smooths out the traffic flow (by reducing the stop - start phenomena) and reduces the number of vehicle shunts which used to happen when fast moving traffic would 'hit' a 'wall' of stationary traffic. However it does this at a price of slowing down the overall traffic speed by as much as 10%. This might be because it is an automated system and the criteria has been set too sensitively, so it switches on too soon / when it ought not to. As of spring / summer 2008 the film-based cameras which enforce these speed limits are being replaced with digital cameras. As this will make it significantly easier to detect vehicles travelling above the limits and process prosecutions, so the thresholds at which the cameras are 'triggered' are also being reduced to the 'normal' threshold of 10% + 2mph (ie: 79mph for a 70mph limit). Since the cameras are active 24/7 (ie: even when the variably reduced speeds are not in force) so this means that even vehicles safely travelling at what many people consider to be the 'normal' and 'reasonable' motorway speed of 80mph will find themselves being caught out. It must also be remembered that insurance companies normally sting people with speeding convictions by demanding higher premiums. Click the cashtill or speakers icon to hear the cashtill ring up a sale. (This link leads to an 8kb file called "cashtill.mp3"). Combined Variable Speed Limit and Speed Camera sign on the western section of the M25 near to Heathrow Airport. 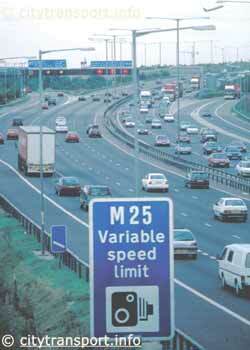 The larger version of this image more clearly shows how the variable speed limit ends for traffic leaving the M25. As this image shows, some sections of the M25 have already been widened from three to four lanes - hence the gap in the hard shoulder under the bridge. Evening peak-hour traffic congestion near the M25 / M4 Junction in West London. Note how that even with four lanes and variable speed limit set at 50 mph congestion still occurs. It is often suggested (in jest) that what the M25 needs are not speed cameras but "pay and display" machines as used at car parks! 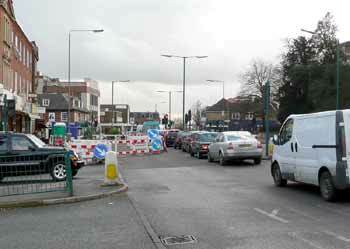 There are also some places where congestion is a direct result of the road authorities. 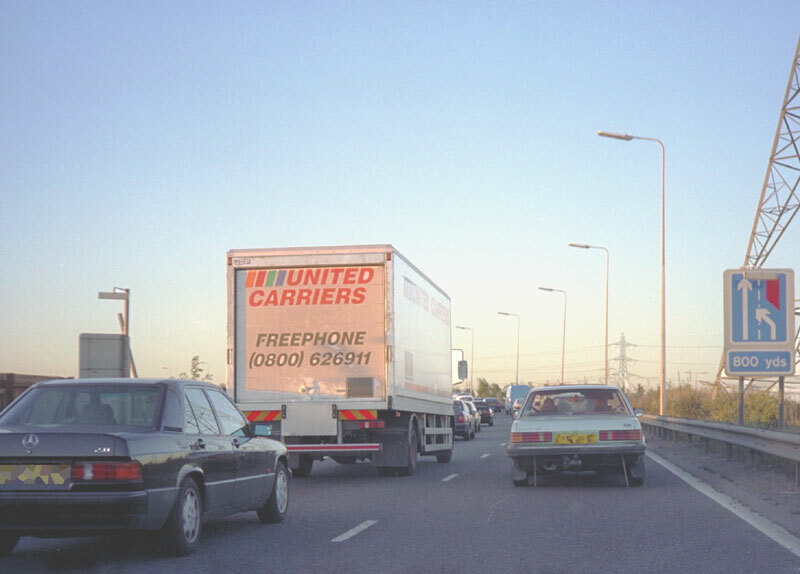 Traffic congestion on the M11 motorway which is directly attributable to traffic mis-management policies forcing two lanes of traffic to merge into one. This image was sent in by someone, and although the logo suggests it is in jest it points to a reality which all too often is exactly how things are. 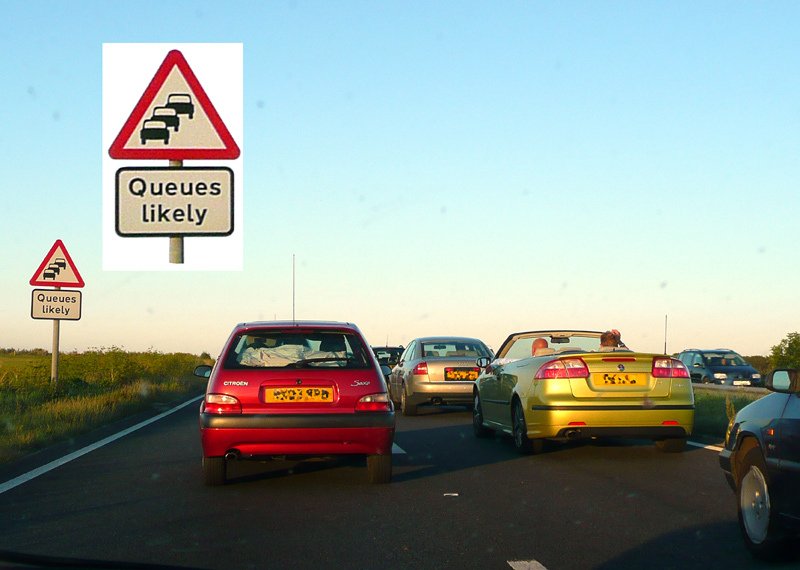 The view (above left) of the M11 motorway entry slip road at Redbridge shows evening peak - hour congestion that is directly attributable to traffic mis-management policies which saw the entry slip road being reduced in width. 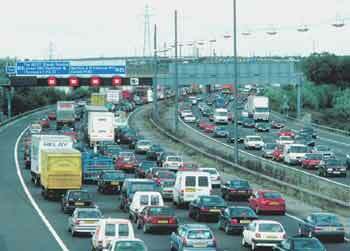 Often the traffic is so heavy that the congestion starts at around 3pm - and lasts until after 7.30pm. 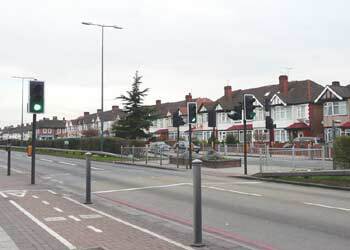 Amazingly this road space reduction was carried out in conjunction with the opening of a new 3-lane road which leads into it - the A406 Barking to South Woodford extension of London's North Circular Road. Not shown are the feeble road signs (similar to the sign seen at the top of this page) installed to warn of 'possible queues ahead' . In this location the solution would be to modify the road lane markings at the junction where the slip road joins the main carriageway and then re-open the closed lane. Perhaps a mandatory part of the traffic planners employment (ie: the people made the crazy decision to reduce the road's capacity) should be to be forced to endure the consequences of their actions. Preferably every Friday evening at 6.30pm when they would rather be home 'sooner' rather than 'later'. Especially on rainy winters' evenings, when the traffic is at its slowest, and always outside of their working time - so that it only inconveniences them (and not their employer), as this will help them to truly appreciate just how much their well (sic) thought out decisions negatively impinge upon the unfortunate victims (ie: homeward-bound travellers). An example of a road layout at a traffic signalled junction being modified in a way which actively reduces road space. Whilst many people will welcome making life for pedestrians easier, it is very hard to know how removing a road lane (as seen above right) and extending the footpath all of a couple of yards makes such a difference as to be worthwhile. What it does do is tick some boxes in a smug self-centred anti-traffic transport planners' design manual which details how to use making life better for pedestrians as a nefarious trick to make life significantly worse for anyone who has the temerity to wish to travel by motorised transport - which includes by bus. The Curse Of The Hole In The Road! Whilst everyone understands that roads sometimes need digging up to access the utility services below them (gas, water, electricity, telephone, sewage, etc) it often seems that irrespective of what the utility companies say about minimising the inevitable resulting disruption their works frequently take a seeming eternity to complete, in the process holding innocent luckless travellers just trying to get from A to B as hostages to misfortune. The way they reduce traffic flows (in the process increasing congestion) by leaving lanes closed even when no-one is working - especially at [traffic signalled] junctions and on the approach to roundabouts - only serves to give the impression of salt being rubbed into wounds. 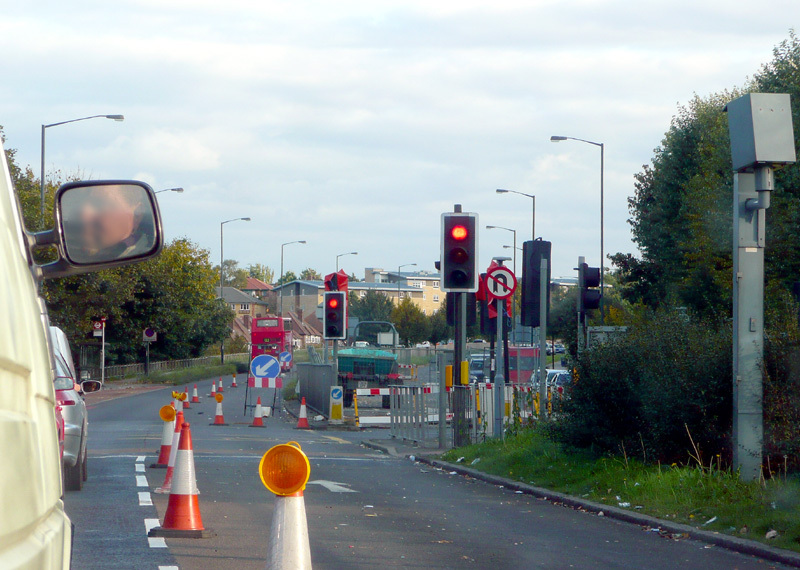 Road works can be found just about anywhere, but these images mostly focus on road works at traffic signal controlled junctions - where they tend to reduce road capacity in ways which make already difficult situations even worse - and locations where there are temporary traffic signals. 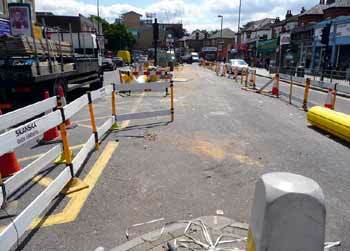 Examples of road works closing lanes at traffic signals - guaranteed to create havoc! In addition to closing a lane in this direction these works closed two lanes (one of which was the sole lane for right-turning traffic) in the opposite direction. 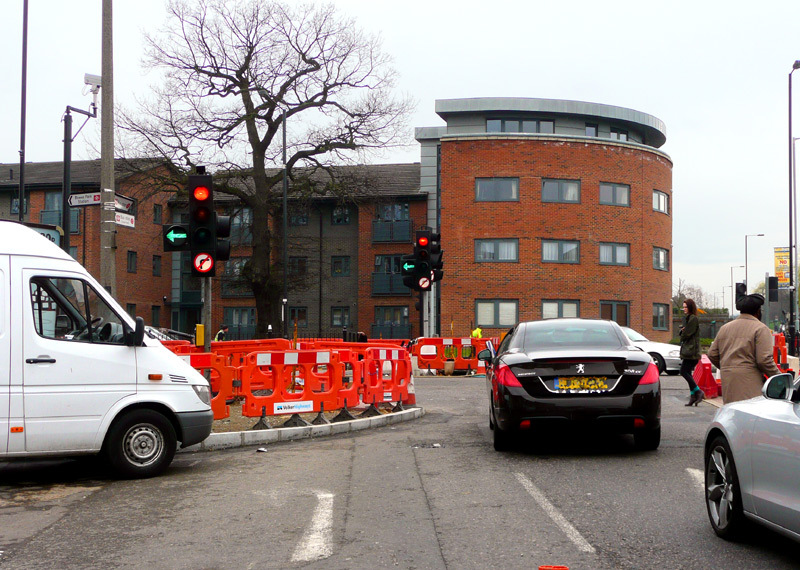 The lane closure also extended through further traffic signals (not seen here) and right up to a roundabout entry slip road. Delays in excess of 20 minutes were typical, although many car drivers (travelling in this direction) found solace in the use of nearby residential roads - an option not available for buses or goods vehicles. Woe betide anyone depending (with their life) on the swift arrival of an ambulance or fire engine using this route. This lane closure resulted in traffic trying to turn left from the turning in the foreground often having to wait for numerous signal cycles to pass before (a car at a time) being able to exit from the side turning. These images all show what could be said to be the causes of a terrible waste of fuel, as well as sources of significant air pollution. Even if vehicle drivers constantly switch their engines off whilst stationary the constant stop start / on off would mean that much wastage would still be occurring. These works resulted in the temporary closure of a traffic signal controlled right-turn lane - but whilst holes were dug in the road none of these were along sections of road used by traffic turning right! Instead the space was used as a storage area, although by the time these images were taken most of what was being stored there had already been moved / buried underground. But it was not just road users who were suffering... this works forced a bus route which serves local residential areas to be diverted away, so many bus passengers endured many weeks with a complete of loss of their service. Since none of the holes were dug in ways which would have actively blocked right-turning traffic it has to be asked whether the road and bus users were being unnecessarily inconvenienced? 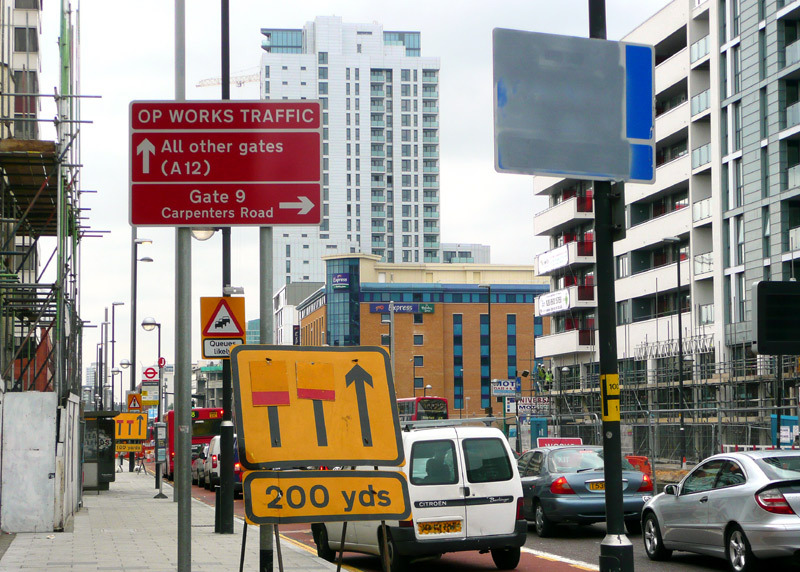 These works in the Stratford area of London were related to road junction changes in connection with the building of the 2012 Olympic Games site. Short of completely closing the road the works could not have been managed in a way which causes worse delay and suffering... not only are 3 lanes of traffic reduced to a single lane but the constriction extends through a busy traffic signalled junction (not seen here), helping to minimise traffic flows and thereby maximise delays. As a bus passenger at the time it was quicker to walk! At this junction the traffic flow was reduced from alternate cross flows to each of the four individual traffic flows having their own turn. The result of this was variable, and even outside the rush hours some traffic flows endured 20+ minute delays. When photographing here (during a lunchbreak) a passing schoolboy who was walking home pointed out that in the morning the delays on his bus journey had made him 30 minutes late for school, so he was walking home for lunch as although he would be late back afterwards it would still be quicker than travelling on the bus. 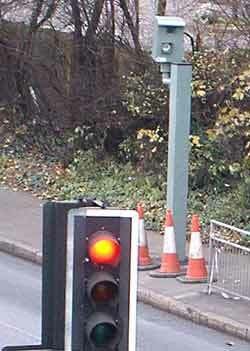 Note that in the image above left the red arrowhead is pointing towards the temporary traffic signal, which was showing green. The parked cars on the right of the image (near the bus stop) were in 'pay & display' places and not delaying traffic flow. What made these works even more severe than they might otherwise have been is that at the same time the alternative route (a 3 lane dual carriageway) was also experiencing traffic chaos as a result of road works. The temporary traffic signals at these road works were either badly set-up or not working properly; either way this bus and all the road traffic behind it spent over 5 (five) minutes waiting for them to change! In the meantime the traffic flowing in the opposite direction can be best described as 'zero'. Approach road sign on the A447 Stanningley Road in Leeds, West Yorkshire, which on Monday 11th May 1998 became Britain's first road with a HOV lane (applies to city-bound traffic only). Although initially experimental in nature, after encouraging results and just eighteen months, on Monday, 8th November 1999, Leeds City Council sealed the experimental traffic regulation order making the HOV lane permanent. In Leeds the HOV system operates on weekday rush hours only. This view was taken where the longer special lane ends; the traffic signals (seen in the distance) only operate when the system is in force and their purpose is to hold back the traffic using the general purpose lane and speed the flow of the traffic using the HOV lane. Note the "2+ lane" road marking. Photographed on a non-working day, when traffic was very light. 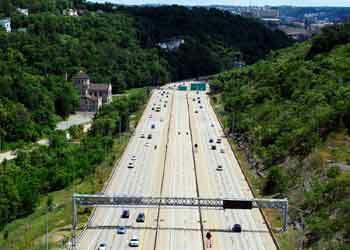 HOV lanes abound in the USA, plus are used in many other countries. It is not the intention of this page to review them all. Interstate 279 just outside of Pittsburgh; the central carriageway comprises of two bi-directional HOV lanes. Image & license: John Marino / Wikipedia encyclopædia. Public Domain. Another solution for trying to maximise people (and not vehicle) throughput over limited road space are High Occupancy Vehicle (HOV) Lanes. 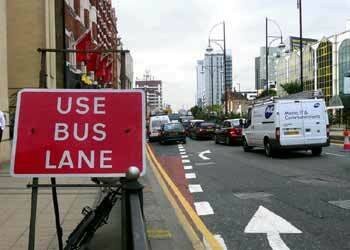 The concept is similar to a bus-only lane, except that private cars carrying two or more people are also admitted. 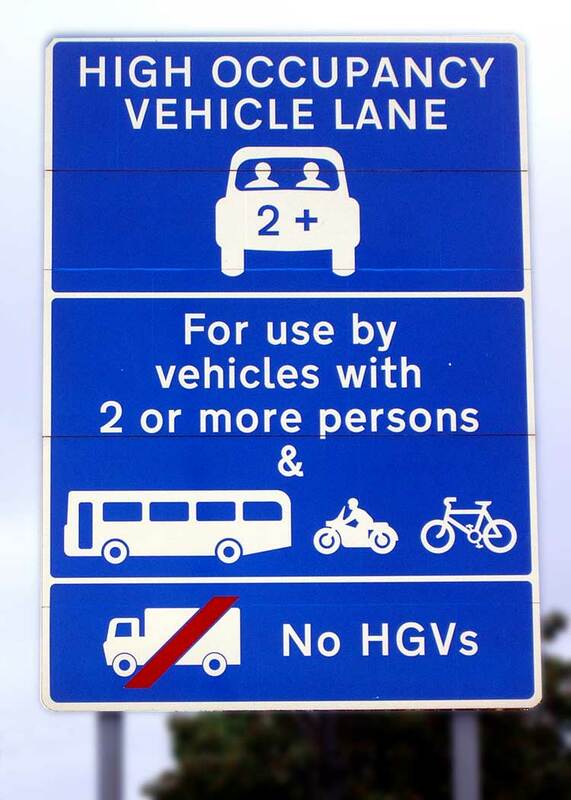 (Different HOV schemes on different roads may vary the minimum 'people' number). The logic behind HOV lanes is that sole occupancy cars take up the most road space. So, in addition to trying to reduce traffic congestion by encouraging car drivers to switch to public transport (buses, etc.,) HOV's help to provide a solution by encouraging people who drive to travel with others. The introduction of HOV lanes in Britain led to the creation of several car sharing schemes, which aim to match motorists with passengers, and it seems that as long as only minimal fuel expenses change hands (ie: there is no profit motive) then the tax authorities will look kindly upon the financial aspects of car sharing. 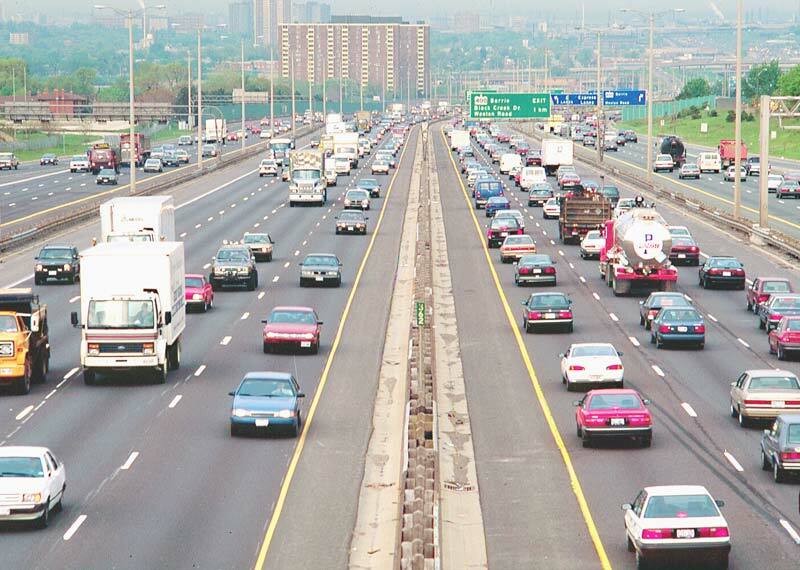 However, as ever, there will always be "winners and losers" and some members of the community (commercial travellers on company business, trades people eg: plumbers, midwives, etc.,) usually have to travel alone so despite needing to be able to use the roads for their employment they are unable to directly benefit from HOV systems. 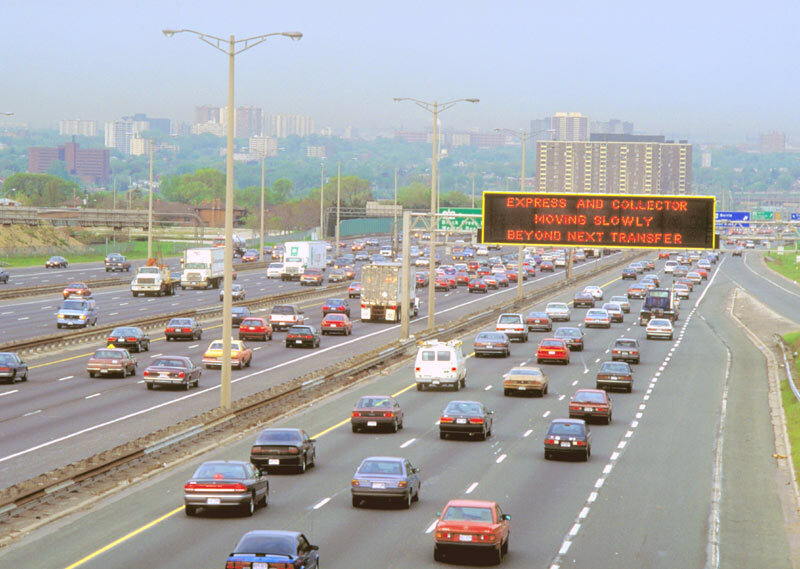 As the sign in the image panel (left) suggests, heavy goods vehicles also lose out, as they are banned no matter however many the occupants, as apparently they could interfere with the optimum working of the HOV lane. It could be however that some HOV schemes will allow HGV's with two or more people, aboard - it will depend on the location and traffic profile of the roads involved. The first British HOV schemes were in Leeds and the South Gloucestershire / North Somerset area. Leeds was first, with their system opening on 11th May 1998. In December 2004 it was announced that 'flagship' a HOV scheme would be trialed on the M1 motorway between junctions 7 and 10 (Milton Keynes South to St Albans) with the idea being that if it proved successful then it would be extended further north when more sections of the motorway are widened (as well as rolled out on to other motorways too). However this was scrapped in March 2008 after a feasibility study decided that it "could lead to an increase in accidents". This is because it was proposed to use the outside lanes, and (suddenly!) someone had recognised potential hazards in that vehicles on other lanes could be "undertaking" others in the outside lane (passing on the inside is illegal - although poor lane discipline by 'middle lane hoggers' means that it frequently happens anyway) and over concerns about how the police would be able to pull over non-compliant vehicles. It also pointed out that there was no reliable camera system for checking the number of occupants in vehicles - although that might not be exactly so (see below). 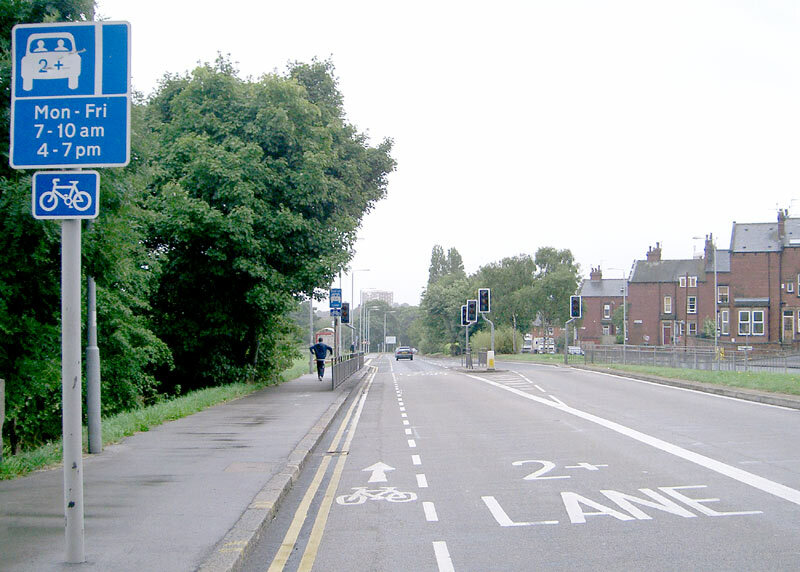 In Leeds the HOV scheme applies to inbound traffic only, utilising the existing nearside lane of the dual carriageway of the A647 Stanningley Road. 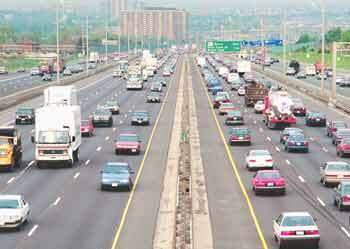 To accommodate 3 side roads and a parade of shops, the HOV lane is in 2 sections (0.4km and 1.1km) over 2km of highway. Outside of Britain HOV lanes are a well proven concept in North America (where they are often called carpool lanes, commuter lanes or diamond lanes - the latter because of the diamond shaped road marking which is used to delineate them) and Australia, plus some exist in Europe too. Apparently one scheme in Madrid, Spain found that so many vehicles met the 2+ specification that to make the system work they had to change to 3+. One of the biggest obstacles to HOV lanes comes from enforcement, which has to be undertaken by police officers, who have many other duties too. The tricks and dodges which North American car drivers will use to try and get around the HOV regulations are legendary. These include the use of blow-up dolls and dummies (which often are little more than foam heads on broomsticks) to make it look as if there are some passengers(s) when in fact none are being carried. More legitimate methods to meet HOV regulations include carpooling, ride sharing and the carrying of hitch-hikers (or students). Sometimes these arrangements will include an exchange of money, possibly towards the fuel bill or as a 'thank you' for travelling with me (ie: the vehicle driver pays the passenger - typically students)! In all cases however the meme is one of helping the otherwise solo driver to legitimately meet the carpool lane occupancy regulations. Whilst it is best to make such arrangements between people who know each other some American HOV schemes feature unofficial slugging areas where solo drivers regularly find passengers to carry so that they can travel in the HOV lanes. It is questionable whether HOV lanes really are a long-term solution - or just another short term "fudge" aimed at temporarily improving traffic flows. 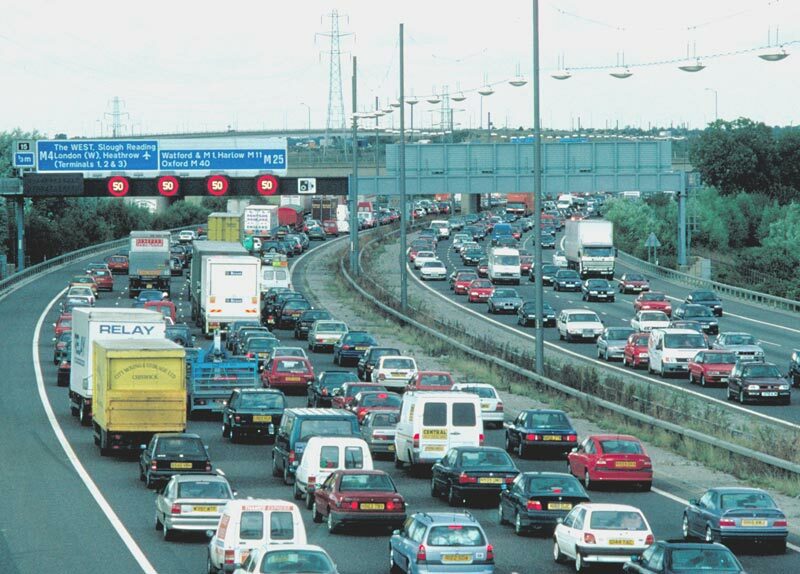 The (British) Department for Transport (DfT) suggest that increasing car occupancy rates could reduce the numbers of cars on the road by 5% and, thus, significantly cut congestion. But a Leeds traffic survey conducted in May/June 1999 found that after just 2 years traffic flows on the A647 had returned to 1997 levels, although there was also evidence of an increase in scheduled bus services and people travelling by motorcycle and pedal cycle. It might be significant to note that in the same time period the economy of Leeds City centre has been booming, so this too would account for increases in all modes of transport. 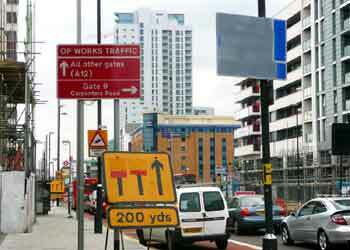 However experience in Leeds has shown some success in reducing sole occupancy of road vehicles. The average car occupancy rate for Leeds is 1.3 persons per car and the commencement level for the A647 in May 1997 was 1.35. By September 1998, surveys showed that this had increased to 1.41 persons per car, mostly by traffic transfers. By June 1999, A647 car occupancy had reached 1.43. On the A647 specifically, HOVs have increased by 55 vehicles (5%) over the 3 hour morning peak. The figures also show a higher proportion of HOVs are now travelling in the morning peak hour (an additional 105), perhaps because this is their preferred time and their journey is more predictable. There have also been small increases in 3, 4, and 5+ occupancy vehicles. Journey times have improved too, with time savings for the 5km trip from the Leeds Outer Ring Road to the Inner Ring Road initially being in the order of 2.5 minutes, but after some "tweaking" of traffic signals this improved to nearer 4 minutes. In 1998 bus operator FirstGroup reported that their standard scheduled services were showing time gains of 3.5 minutes. Additional information from various Internet sites, especially a 755kb Adobe Acrobat "pdf" file which contains further information and illustrations but does not identify its creators, which is a shame - as this means that they cannot be credited. The file can be downloaded from this web site by clicking here . It is not the aim of this webpage to keep a tally of the large number of HOV lanes which are now being introduced around Britain. 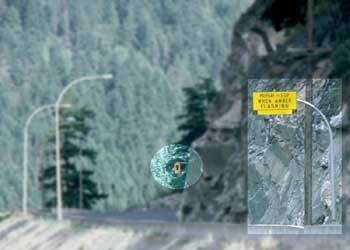 In summer 2005 it was reported that an automated camera detection system was under development - amongst the challenges which needed to be resolved were to correctly detect occupants in vehicles with partially obscured windows / passengers only in the back seats / vehicles with children in them / babies in child seats... plus of course that no-one is using blow-up dolls or dummies - these being the legendary North American 'dodges'! In late 2007 a new infrared CCTV system was unveiled which can count the number of people in a vehicle - and differentiate from dolls, dummies, or whatever - by detecting human skin and counting faces. Known as Dtect, this system uses cameras which are elevated so they have a three-quarter vantage point of vehicles on the road and are therefore able to get a clearer view inside a vehicle - which includes taking images through a vehicles' windscreen. At present the promotional buzz words and catchphrases include that it would allow the police and authorities to monitor how many people are in the car accurately while not infringing people's right to privacy. Some media reports have talked of the possibility of a legal challenge on the basis that the use of Dtect cameras amount to illegal surveillance, although it is probably too late for that, especially in a country where CCTV camera systems are virtually already on every street corner. Occupant-based Variable Charge Road Pricing??? One possible future use being touted for Dtect camera systems is that they could be also used to police sophisticated local congestion and road pricing schemes in which discounts could be offered to anyone willing to share a vehicle. Road Pricing is more fully explored on the Road User Tolling and Congestion Charging page. A few simple ideas that would reduce the death toll caused by accidents. In no way is this list meant to be exhaustive. Some of these suggestions may require legislation. This list was mostly written in the early days of this website (around 2000), since when some of these ideas have began to be realised. All vehicles should be fitted with the type of wheels and tyres that if involved in a high-speed blow-out still give the driver enough 'control' to stop safely. At present when most wheels / tyres blow-out the vehicle loses steering ability, causing danger to all road users (& on urban roads pedestrians) in the vicinity. All vehicles should be fitted with fuel cut-off devices so that if there is an accident the supply of fuel to the engine is halted. All vehicles should be fitted with electrically heated windscreens so that in wintry weather motorists who have a time constraint on their journeys will be less likely to drive "blind" because they have not cleared their windscreens and as their engines are still cold the heater / demister is only blowing cold air. All articulated vehicles should be fitted with 'anti-jackknife' devices that will stop the trailer sliding out sideways in heavy braking. To reduce the risk of bulb failure (especially dangerous with red lamps at the back of vehicles) all external lamps - except headlamps & white reversing lights - should be replaced with LED's (light emitting diodes) which will last many, many years and draw almost no current. All 'high cab' vehicles should have effective detection systems (mirrors may suffice) so that their drivers can 'see' cyclists on their inside and avoid sideswipping cars when changing lanes. This should apply to both left and right hand drive 'high cab' vehicles. Because of the severity of the danger it is quite reasonable to prohibit overseas registered vehicles which do not have this equipment from entering the country. To assist with 'seeing' moving vehicles - especially at junctions - it should also be mandatory that ALL moving vehicles use front & rear marker lights. To assist with 'seeing' pedestrians (and cyclists) during the hours of darkness pedestrians should be encouraged and cyclists required to wear light coloured outer clothing or reflective safety belts / armbands. Especially in inclement weather when vehicle windows might be (partially) misted and windscreen wipers create a slight blurring, giving the drivers reduced visibility of their surroundings. There should be greater attention to road design and junction layout as too often accidents are caused by road planners 'building in' danger. There should be greater recognition of driver frustration and how it makes otherwise reasonable and safe drivers take often dangerous chances eg: recklessly overtaking when stuck behind a slow vehicle because all the 'safe' locations have reduced speed limits and self-financing safety-reducing entrapment cameras. There should be a requirement on the police to minimise delays to road users when a road traffic accident forces the closure or partial closure of a road - at present it seems to be policy that all other road users are forced to become unwilling victims of the accident too, with the delays often resulting in the frustrated road users driving hurriedly - in the process becoming "less safe" drivers. These delays also have expensive hidden costs (eg: missed appointments, flights, etc) and can force drivers on tachograph equipped vehicles to exceed their permitted driving hours. Keep your distance chevrons on the M1 Motorway in Leicestershire. 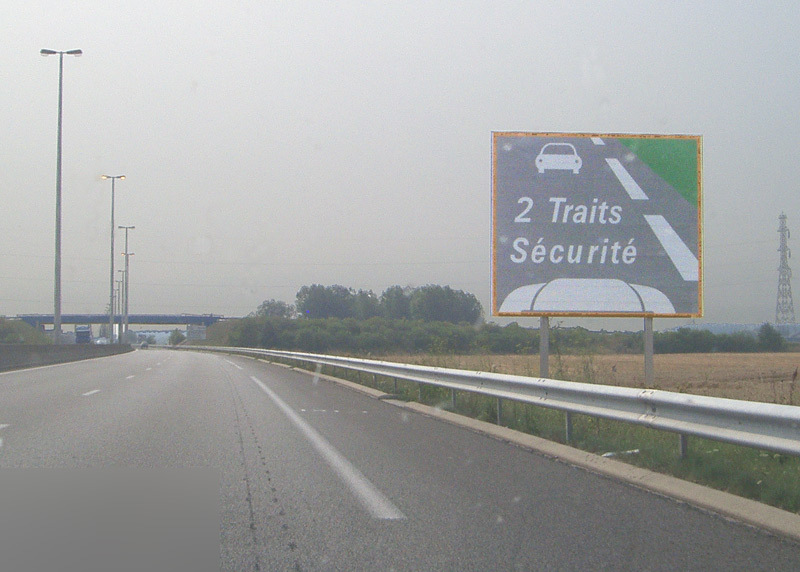 Recognising the importance of keeping a safe distance from the vehicle in front the French have modified the hard shoulder lane markings on their Autoroutes to help road users judge whether they are too close. Especially on faster roads a significant source of danger comes from vehicles which are travelling too closely... and then when the driver of the front vehicle brakes sharply (or has a tyre blowout, swerves to avoid an obstruction in the road, or something else happens) there is insufficient time for the driver of the next vehicle to safely react and reduce their speed (enough) before the vehicles collide. 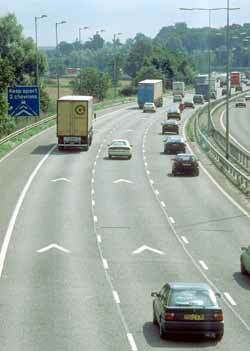 In the absence of radar and other on-vehicle electronic systems which inform vehicle drivers when they are too close to the vehicle in front the early 1990's saw some experimental road markings which encourage vehicle drivers to keep a safe distance from the vehicle in front being tested on several British motorways. Located 40 metres apart the idea was to encourage vehicles to avoid shunt accidents by keeping two chevrons apart, which at 70mph equates to the 2 second minimum time period recommended in the Highway Code. Research showed that these road markings helped reduce accidents by as much as 56%, with multi-vehicle high speed shunts down by 42% and single vehicle swerved to avoid other traffic accidents down by 89%. Furthermore, the keep your distance effect could be detected up to 11 miles beyond the end of these markings. Before these markings were installed 1 in 5 vehicles were found to be travelling too close; this experiment reduced the figures to 1 in 7. With the experiment having been proven worthwhile this style of chevron markings have been installed on various motorways and other higher speed major roads around Britain. Perhaps the greatest deterrent to the success of this safety measure would be that while some drivers will try to keep a safe distance from the vehicle in front other drivers, on seeing what to them looks like a large gap, will fill it. This unusual looking traffic signal is actually demonstrating a clever way of inducing safer driving on the approach to a traffic signal controlled junction. Ordinary traffic signals enhance road safety by controlling the flow of vehicles and pedestrians where they intersect, but often they also cause accidents when the green phase ends and drivers of approaching vehicles have to make a split second decision whether to brake harshly (and hope that the vehicle behind is also stopping, and will do so without crashing into them) or slam on the accelerator and hope to get past the traffic signals before they change to red. Road safety experts often warn of the dangers of harsh braking as it can lead to a vehicle skidding and the driver losing control (especially in inclement weather), as well as creating extra wear and tear which can be detrimental to the vehicle. Utopians often suggest that when approaching traffic signals motorists should always expect to have to stop, but in the real world the last thing a motorist travelling at 65-70mph should be expected to do is slam on the brakes for what effectively becomes an emergency stop - especially if the traffic signals are equipped with 'red light' cameras. 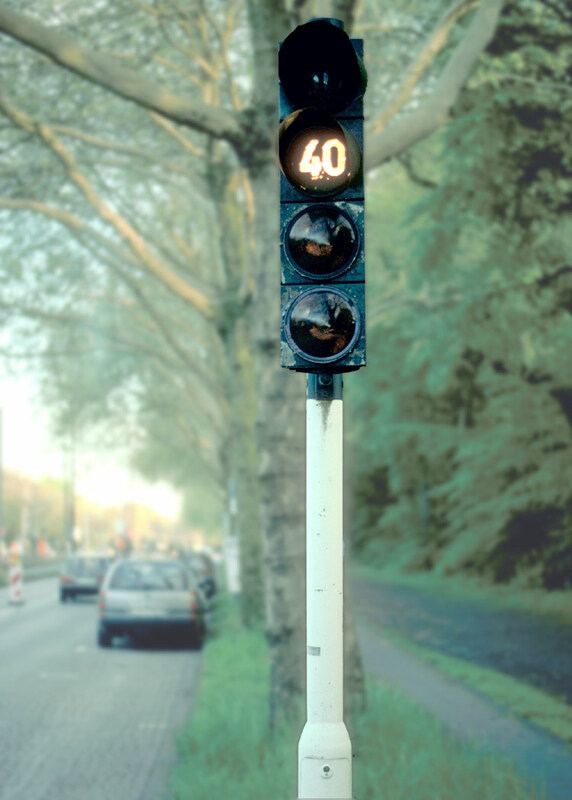 The danger is greatest on roads with higher speed limits, but in the Düsseldorf street shown here the speed limit is 50km/h (about 30mph). 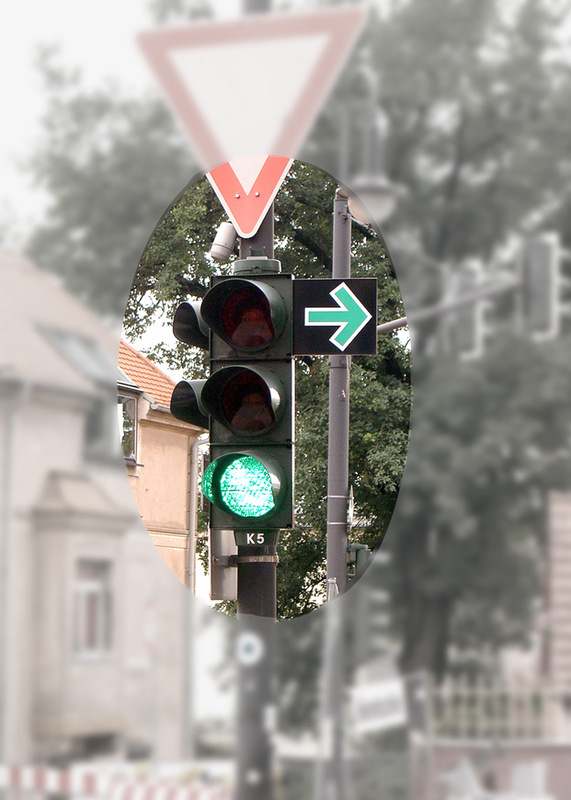 As demonstrated in the (speeded up) animation, first the numbered spectacles illuminate advising motorists of the speed at which they need to drive to 'catch' the green light, (slower at first, faster later) and then when it will no longer be possible to reach the traffic signals while they are showing a green phase the lower two amber spectacles will flash alternately advising motorists to be prepared to stop. The amber lights stop flashing when the traffic signals have changed to red. be prepared to stop when the twin amber lights on it are flashing. 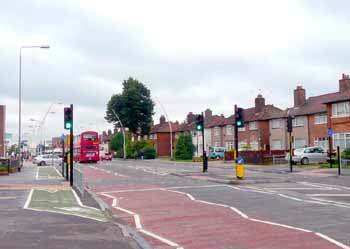 It protects traffic signals (just about visible) around what for approaching motorists is a blind bend. Seen in a rural area of western Canada. The Spanish seem to have found an equitable way to slow speeding traffic down in their villages. All they do is link traffic signals to vehicle speed sensors - and arrange the signals to function so that vehicles which are travelling through a small village more quickly than the speed limit are forced to stop at the traffic signals. Whilst this could work here in Britain too it quite possibly would result in a drop in takings for the Speed Camera Partnerships. Of course if (as they say) safety is their primary objective then this will not be a problem. Just How Long Before The (Traffic) Lights Change??? No-one likes waiting zombie-like at traffic signals until their turn is reached in the sequence. 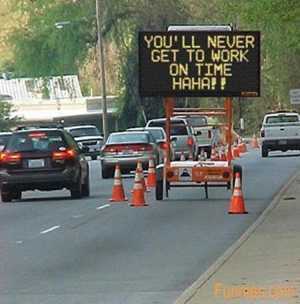 Even if the wait is only for a minute it can seem to be interminable, with this time-theft leaving people feeling blue. Indeed when this sort of delay occurs 'time and time again' within the same journey, in the process significantly extending the overall journey time, the cumulative delays have the potential to make motorists red with anger (aka: suffer from a bout of road rage) which can also result in them entering into an emotional state known as a 'black mood', when they will (potentially) cease to be rational beings and instead become like a person who is drunk (or drugged etc.,) and unwittingly do things that are dangerous both to other road users and their own long term health. (The term "black mood" is so-named because when in this condition people really do feel as black as night, and despite being an emotional state it can have real physical effects on the human body, as well as cloud rational thought processes). 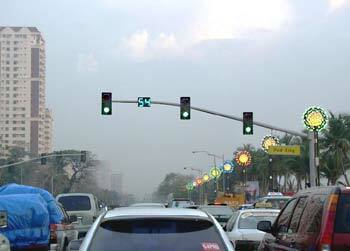 Motor vehicles sitting at traffic signals are also a significant source of air pollution. Cars, motorbuses, lorries, etc. In inclement weather pedestrians can also find having to wait (for the "green man" or "green hand", etc) whilst getting a soaking to be most unpleasant - and to be a good reason for choosing to "travel by car" on their next journey. It is not surprising therefore that (especially in Britain) most pedestrians waiting to cross roads at designated road crossing points (traffic signal controlled pedestrian crossings, road junctions, etc.,) will cross as soon as there is a gap in the traffic flow. 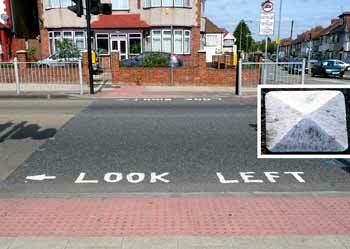 In Britain this is not illegal, although there are some countries where it is a criminal offence to use one's eyes to look at the traffic flow and cross if there is no approaching traffic & it is safe to do so - instead the pedestrians MUST wait for the "green man" (eg: Germany). 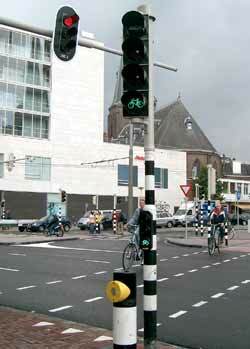 In many overseas countries it is also usual policy that at night the traffic signals at some road junctions are switched to flashing green or amber ("give way") as it is seen to be pointless to require road users to sit zombie-like for minutes on end (at red lights) when there is simply no other traffic in the vicinity. In some places (eg: many States in the USA) it is permitted for road users to pass a red stop signal when turning right (remember they drive on the right) - except where there is a road sign banning this. A variant which could be used here in Britain too would be to indicate the specific junctions where this is permitted - the example seen here (below left) comes from Dresden in the former East Germany. This image comes from Dresden in the former East Germany, the fixed green arrow next to the red stop lamp tells motorists that it is permitted to turn right on red lights. To make it easier for road users (including cyclists) to see when the traffic signals change to green the French locate repeater lights half way up the pole. group of forums at http://www.skyscrapercity.com. Most British drivers will know what the grey device seen here is for... and whilst slightly longer amber phases and advance warning that the lights are about to change would also help improve road safety (as seen in the section above) the reality is that a small minority of vehicle drivers DO blatantly ignore the rules of the road - spreading danger to all other road users and pedestrians alike. To try and reduce the frustration as well as discourage the jumping of red lights some countries use countdown timers to inform road users of how long it will be before the signals change in their favour. Sometimes the timers also advise motorists of how much time is left before the green phase ends. This image comes from Manilla (Phillippines). Vehicles jumping level crossings is such a serious problem that at some locations Network Rail has had to install traffic signal style "red light" camera systems. 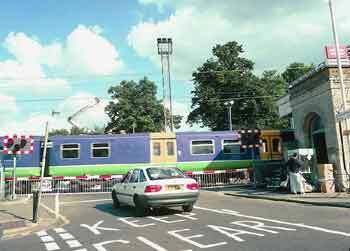 Many road users would however question why such a long delay is required between the level crossing being activated and the arrival of the train. 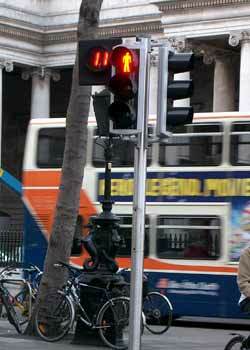 Traffic signals apply to ALL road users - whether they are on 2 wheels - or 14! Unfortunately many pedal cyclists treat them with contempt and just cycle through - often forcing pedestrians who are crossing the road to scatter (flee) for their lives. Yet pedal cyclists have a unique safe and legal alternative option in that they can dismount and walk! Road users jumping "stop" signals are also a source of danger for the railways too - yet, curiously even though they are innocent victims the railways are often seen to be the villains. In New South Wales, Australia they even made their High Speed Trains slow down because too many road vehicle drivers were causing accidents at level crossings. 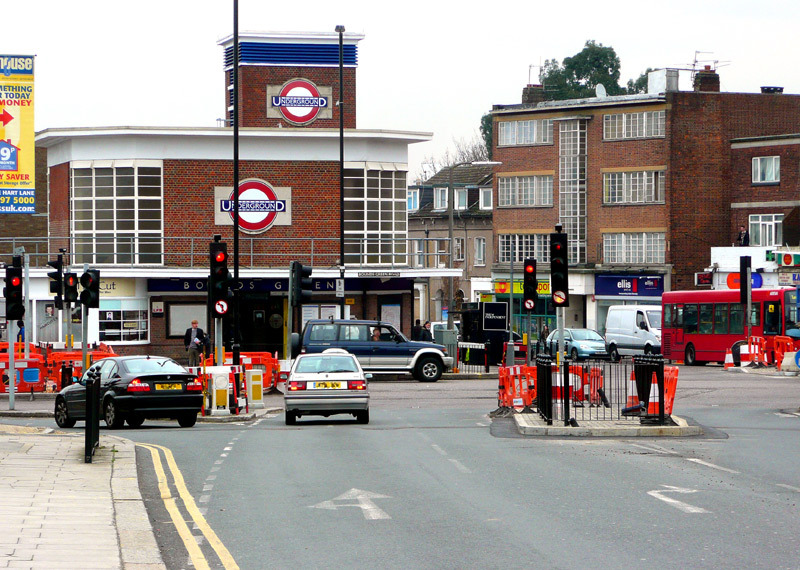 This level crossing is next to Acton Central station on the North London Line (London Overground network) in west London. As this image suggests, pedal cyclists can avoid the frustration of sitting at red lights by dismounting and W-A-L-K-I-N-G! This image is a video-still - a short clip of the video from which it was sourced has been placed on the ‘YouTube’ film / video website and can be watched (in a new window) by clicking the image, projector icon or here - http://www.youtube.com/watch?v=zyWXWZYrmJA. 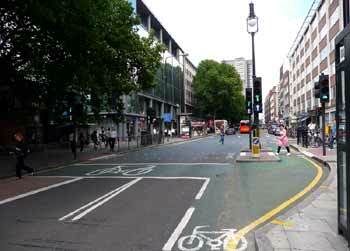 In addition to showing the cyclist who is waiting at the traffic signals and the cyclist who is walking the bike on the footpath the video also shows that the partially obscured cyclist seen just in front of the yellow box front took advantage of the pedestrian phase in the traffic signals to turn right. Traffic signals dedicated to cyclists are less usual here in Britain - especially in older towns and cities where lack of road space means that the cyclists are rarely provided with dedicated cycle lanes which are physically separate from the other road traffic. As the image below left suggests, sometimes even where these facilities do exist one wonders why anybody bothered! More commonly found (in older towns and cities) are advance waiting areas. 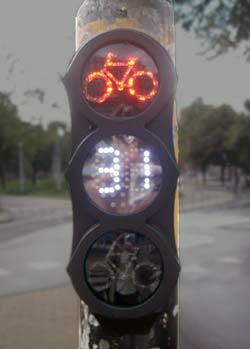 These encourage cyclists to go to the front when waiting for traffic signals to change. In the two images below the special cyclist symbols on the traffic signal heads are more easily seen in the clickable larger versions. Maybe there is a reason why this dedicated cycle lane has been blocked off with a barrier with 'diversion' sign on. However, since the diversion is to a lane where there is a compulsory left turn so it is unlikely that it will be heeded. This example is seen in the Clerkenwell area of London. Advance waiting area (in front of the main traffic lanes) and a dedicated cycle lane. Locating them both at the same traffic signals could be seen as 'going over the top', but it makes for an interesting contrast in cyclist facilities at traffic signals. The Dutch are very proactive in providing extra facilities for pedal cyclists, and in addition to special traffic lanes and off-road cycleways this often also includes dedicated traffic signals - such as seen here in the city of Arnhem. In an attempt to encourage cyclists to obey the traffic signals some Dutch cyclist signals also include count-down timers advising how soon it will be before the lights change and it becomes safe to cycle through the junction. This example was seen in Amsterdam. 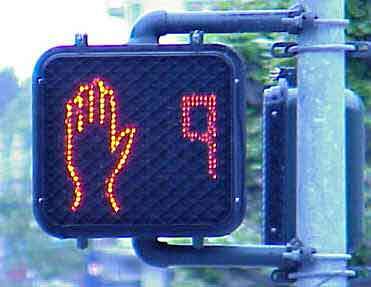 These pictures come from San Francisco and show pedestrian countdown information as used at road crossings. 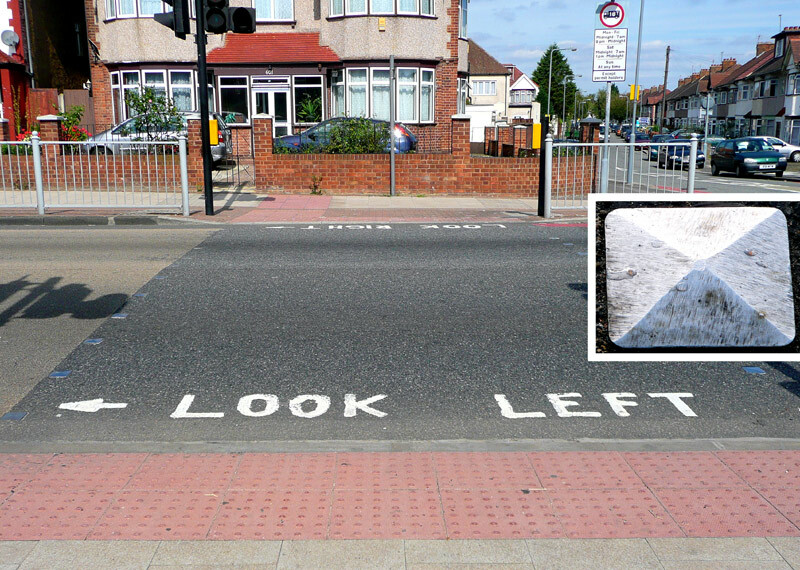 Above left: You may start to cross the road. Above right: If the hand is flashing (and showing a time), continue to cross the road but if you are on the footpath then do not start to cross the road (or cross at your own risk!!!). If the hand is solid, and no time is shown, remain on the footpath. (link used to lead to the relevant webpage but has been deactivated as the page has either been renamed or removed). Countdown information advising pedestrians in Dublin, Eire, how soon it will be before the signals change in their favour. 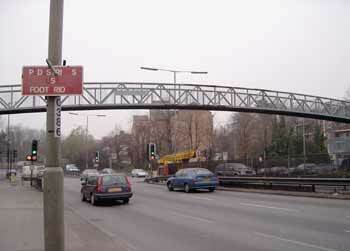 Footbridge at a traffic signal junction over part of London's A406 North Circular Road. See text (below) for more information. The sign should say "pedestrians use footbridge" but some of the letters have fallen off. 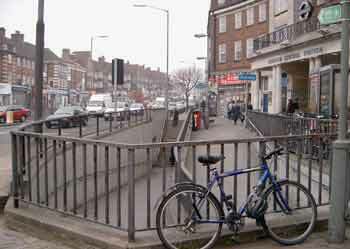 Footbridges and underpasses offer safer ways for pedestrians - and cyclists who walk their bikes - to cross busy multi-laned roads, although not everyone looks upon them favourably. 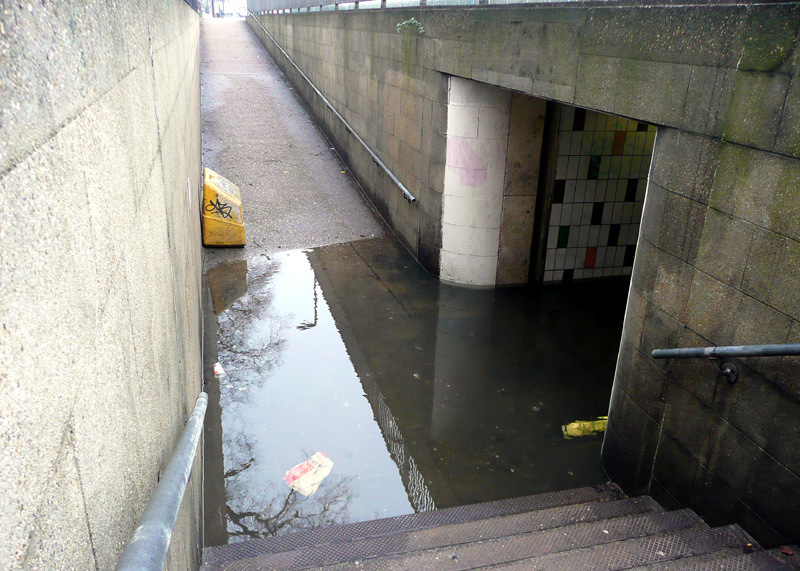 Many people would cite personal safety as being why they would prefer to avoid underpasses, whilst because footbridges rarely offer any kind of weather protection so they can be very unpleasant things to use in wet, windy, weather. 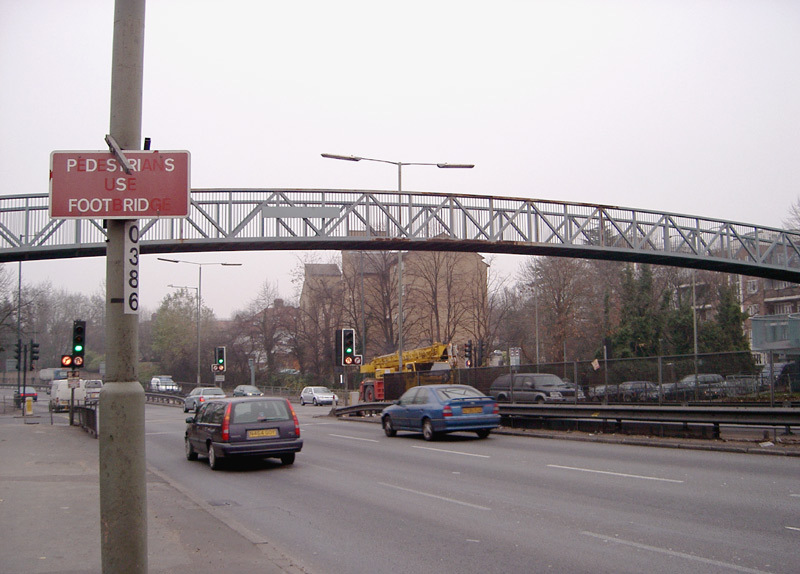 The footbridge seen (above - right) offers pedestrians a safe way to cross a very busy section of London's North Circular Road. 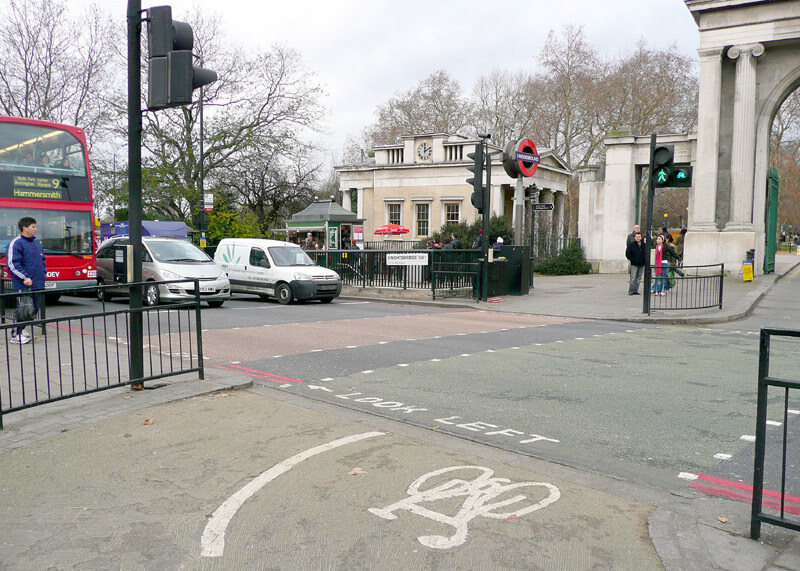 As part of a traffic (mis)management policy in the early 2000's the then Mayor of London and his traffic planners submitted proposals to replace it with a surface foot crossing. 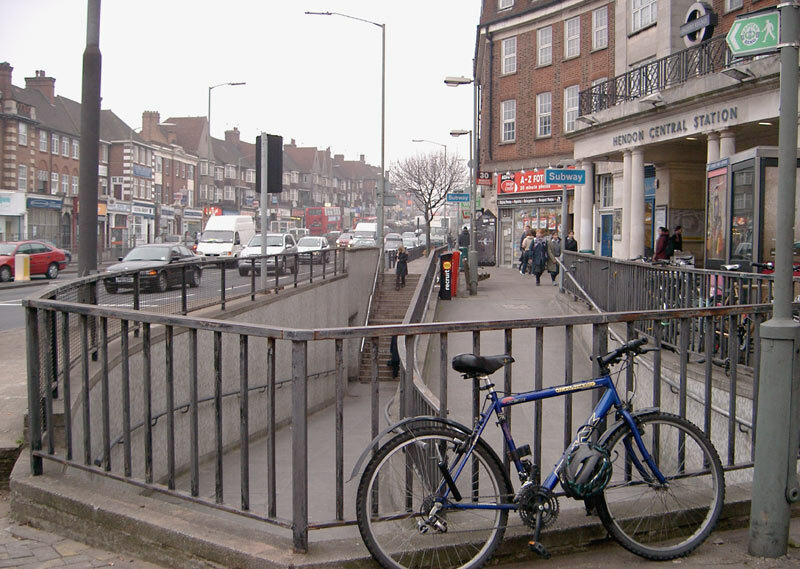 This was (still is) very much something that the local community objected to, as the footbridge was (still is) seen as being a significant safety aid - especially for when unaccompanied children cross the road. Concerns also extended to potential dangers (to everyone) at the admittedly few times when the traffic signals fail, plus that the addition of pedestrian phases to signals at an already extremely busy junction which at busy times already fails to cope with existing traffic flows would only have served to make a bad situation even worse. After much local campaigning the future of the footbridge looks safe. Underpasses offer an alternative way to cross very busy roads, although matters relating to personal safety often are a matter for concern. The example on the right suggests another reason why sometimes people will prefer to avoid them! 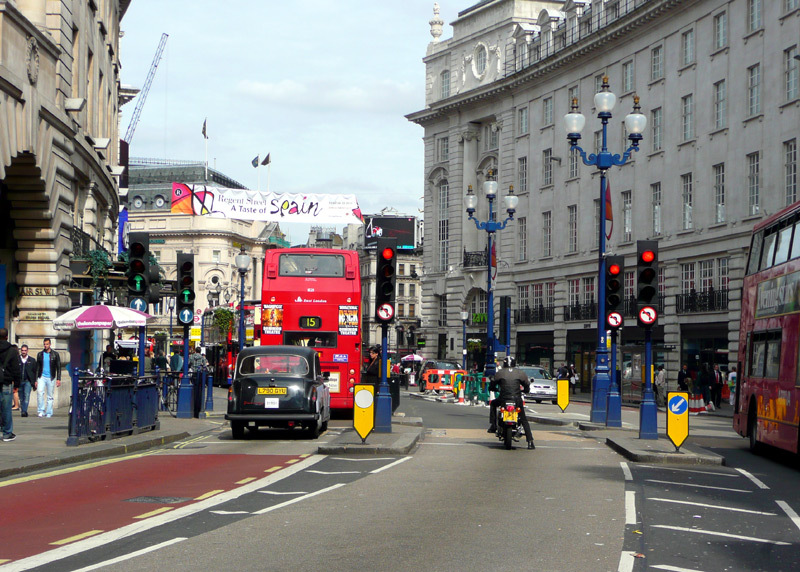 This central London road features what is known as a 'bus gate' where traffic signals are used to regulate the flow of traffic with the buses and taxis being able to use a lane where the 'green' phase is longer (and illuminates before) the signals for the general traffic. Even buses sometimes find that delays at traffic signals can be a nuisance, with (wherever possible) their drivers seeking alternative options. This bus is by-passing transponder operated traffic signals on a bus lane which maybe beneficial when the roads are busy, but because of the delay waiting for the lights to change can also be detrimental at other times. These Italian signals are actually working correctly! Italy is one of the countries where for many years traffic signals changing from green to red would show green + amber and although at the EU's behest they are now changing to amber (on its own) these signals were still operating under the older system. Another operating quirk is that the red lights remained illuminated at all times - with the green arrows also lighting-up at the appropriate times, as required. This would be a way of specifying that only traffic travelling in accordance with the direction shown by the illuminated green arrow may proceed past the stop line. 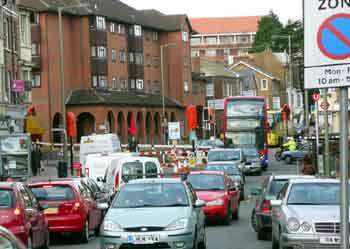 Whilst giving all the different modes of transport their own dedicated phases at traffic signals may sound utopian the reality is that it can result in horrendous delays to everyone trying to pass through the junction. 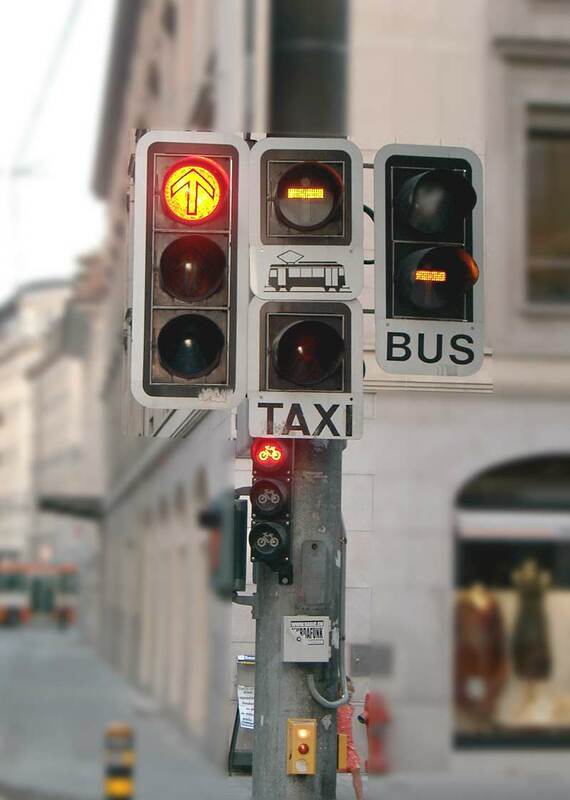 This example was seen in Geneva, Switzerland - and features separate lights for cyclists, trams, buses, taxis, 'the general traffic' and pedestrians. As stated above, in many areas (in Britain) it has now become de facto policy to use traffic signals as an additional way of slowing the traffic down and generally making life less pleasant for anyone who has the temerity to want to travel by road. In this respect bus & tram drivers / passengers suffer along with all other road users - except cyclists who usually just ignore the red lights. Although transport planners and (local) politicians will disagree the reality is that it seems to have become policy to install traffic signals with free abandon, with all but the most minor of road junctions and designated pedestrian road crossings being signalised, irrespective of real need or benefit. This explains why in cities such as London even night-time journeys when the roads are largely congestion - free take so much longer than they did 30 years ago - with the increase in journey time solely due to the significantly increased time spent (wasted) sitting zombie-like at red lights. It would seem that despite their fine words the traffic planners & politicians simply do not care that the more vehicles keep stopping, idling and then starting so the more the air pollution which is created within our urban areas. Reasons why this situation has arisen are multifold. In some locations it will be because positions of power were reached by politically motivated people who dislike traffic (which can be a byword for people who travel by car) having the freedom to make rapid progress because it means that they (the car drivers & their passengers) will then travel more quickly than public transport, especially buses. Some reports suggest that the Treasury (ie: the governmental organisation which looks after the nation's finances) supported actions which cause road vehicles to keep stopping, as constantly stopping and starting / pulling away from rest increases a vehicles fuel consumption - and therefore the taxable income will rise. The actions of luddite anti-traffic lobby groups must also be factored in too. Often these are single issue non-motoring pressure groups comprising of a comparatively tiny number of people which will use any excuse (such as a possibility of an improvement in safety) as lobbying tools to push forward their agendas. Typically these agendas include hoodwinking transport planners (including traffic signal engineers) and receptive politicians to create traffic (mis)management systems as part of a policy of making driving unpleasant. As if that was not enough, because their bidding is done by local governments it is our money that is used to no beneficial effect or to bad effect. Many of these lobby groups actively want to see people switching from cars to buses, and totally fail to recognise that when considering air pollution and the need to reduce it because it is harming our health so fossil fuel powered motor buses must be included along with cars and lorries in the list of polluters / the vehicles which are 'part of the problem'. Indeed, unless a motor bus is fairly full the total amount of pollution on a 'per passenger' basis is almost certain to exceed amount of pollution which would result if the passengers switched to a few petrol engined cars. The lobby groups also fail to understand that motor buses are generally seen to be at the bottom of the list of modal choices.... Whilst there are problems in urban areas with traffic congestion a part of the solution would to change the present system of deregulation to encourage more (& more frequent) off-peak services, as at present there are people who would like to travel by public transport but drive simply for want of a viable alternative. It has to be remembered that people cherish having the freedom to choose how to travel, and also cherish that for the first time in recorded human history we have access to mechanical transports which enhance our lives by allowing us to compress time and reach destinations far more quickly than if we had walked there. Plus people cherish having the freedom to reach remote places that often are not served by public transport at all. And all this is at times which we choose / are convenient to us! Are (Sometimes) GNAT's In Disguise! In addition to being names of types of animals Penguins, Puffins and Toucans are the names given to types of pedestrian controlled road crossings. Before explaining why some types are 'good' and the others 'less beneficial' it may be of interest to go into greater detail about the different types of pedestrian road crossings. Whilst this will include some historical information it is not intended to provide a definitive historical record. 'Gnats' are also names of living beings; an explanation of where they fit in to the greater scheme of pedestrian road crossings can be found further down the page. 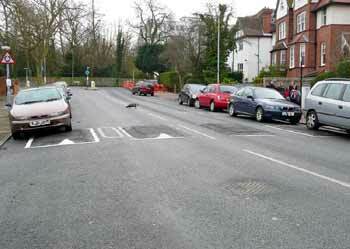 In Britain most of the types of 'at grade'§ road crossing points for pedestrians are named after animals. This policy officially started in 1951 with the introduction of 'Zebra' Crossings, which are also noted for their distinctive alternating black and white road markings plus orange coloured flashing lights on the top of poles painted with black and white stripes and known as 'Belisha Beacons'. As with virtually all types of crossing which followed them Zebra crossings featured metal studs located across the approaching traffic lane approximately 15 yards from the stop line. 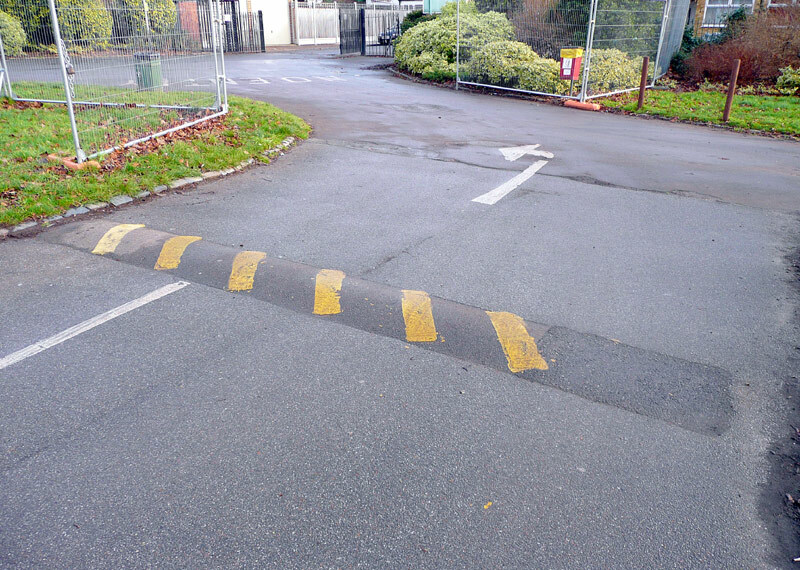 These were a forerunner of the zig-zag lines used at crossings nowadays, and marked the start of an area in which parking or waiting was prohibited. §The term 'at grade' means that it is on the same level / on the surface. The alternatives for road crossings would involve the use of underpasses or flyovers. Zebra Crossings have their genesis in 1934 when Leslie Hore-Belisha who was the Minister of Transport introduced kerbside beacons to indicate designated road crossing points. These beacons comprised of orange coloured globes mounted on the top of poles which were painted in a distinctive black and white stripe design with studs in the road delineating the crossing. 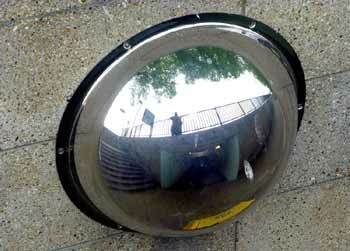 At the time the globes were not illuminated. In 1949 and after complaints about motorists not easily seeing the designated road crossing points trials were started with solutions to making the crossings more visible, with (amongst others) early ideas seeing the crossing being highlighted by painting alternating stripes of blue and yellow. The design which was chosen was the familiar rectangular white stripes which combined with the unpainted black road surface between them gave the impression of stripes matching those of the Belisha Beacons. Whilst this solution proved very successful during the daytime it was soon found that motorists were finding the crossings to be very difficult to see at night, especially during the long hours of darkness in the winter months. So in 1953 a further refinement saw the illuminating of the orange globes; the reasons for choosing a flashing and not steady lamp are not known - presumably it was to make the crossings even more distinctive. Pedestrians have the right of way at Zebra Crossings, as once on the roadway the law requires that the road traffic must give way to them (unless directed otherwise by a police constable or other authorised person). Zebra crossings are often the site of conflict between pedestrians and road traffic because sometimes pedestrians put themselves in harms way by assuming that their right of way means that even approaching vehicles which are very close to the crossing will be able to safely stop in time (and that any vehicles behind them can too) and therefore they walk out into the road without either looking properly or waiting on the kerb for the traffic to stop. It may be that the vehicle driver will still be blamed for the ensuing collision but is it still not better to wait a few seconds and avoid being hit by a moving vehicle? At busy locations conflict also comes because the near continual stream of pedestrians crossing the road effectively blocks the road, causing traffic congestion. In the most severe instances this has been known to have to be resolved by police constables or traffic wardens controlling the crossing, telling pedestrians when they may cross the road and also telling road users when they should not stop at the crossing. Zebra crossings are supposed to have the Belisha Beacon poles on the same side of the crossing as the approaching traffic. This means that on normal two-way roads they will be on the pedestrians' right, whereas on one-way streets and dual carriageways the locating of both poles on the side of approaching traffic means that sometimes the pole will be on the pedestrians' left. Zebra crossings are normally only used on roads with a low speed limit, which typically would mean 30mph (or less) although they might be found on roads with a 40mph speed limit at locations where vehicles would be expected to be travelling relatively slowly. This is for safety reasons to reduce the chances of accidents where pedestrians walk out in the face of oncoming traffic which is not speeding but still travelling too fast to stop. Clicking any of these Zebra crossing images will lead to a dedicated page showing more (and larger) images in a popup window; alternatively clicking here will open the page in a new full-size window. Zebra crossing on a two-way road showing how the locating of the Belisha Beacons on the same side as the approaching traffic means that they are on opposite corners of the crossing / on the 'right' relative to the waiting pedestrians. 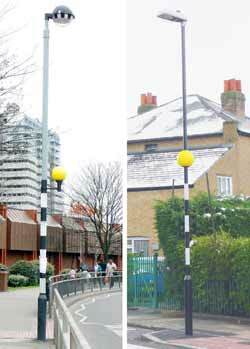 The Belisha Beacons also help indicate the presence of the crossing in wintry weather when it can happen that the road markings are obliterated by a covering of snow. Zebra crossing on a section of dual carriageway showing how the locating of the Belisha Beacons on the same side as the approaching traffic means that they are both on the same side of the crossing / with some on the 'left' relative to the waiting pedestrians. 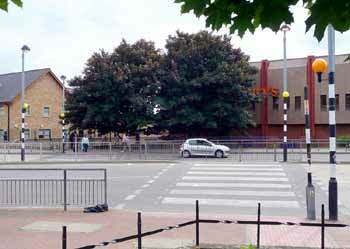 This image actually shows three Zebra crossings, as the traffic island in the centre of the road effectively splits what looks like a longer crossing into two individual sections. Vehicle drivers are not legally required to give way to pedestrians on the 'other' side of the traffic island, although many still choose to do so. 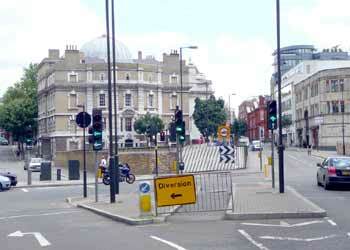 The third crossing is to be seen at right-angles on the left of the road junction. 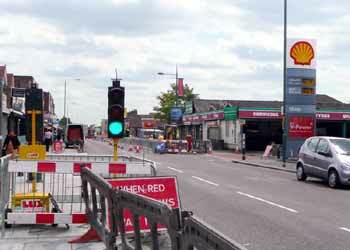 A 15 second video of these crossings demonstrating how only some of the Belisha Beacons flash in synchronisation which each other has been placed on the ‘YouTube’ film / video website and can be watched (in a new window) by clicking either the projector icon or here - http://youtube.com/watch?v=84xOWaHD3ns. Variants on Zebra crossings with central refuges include versions with twin flashing Belisha Beacons plus a creamy white (steady) light, crossings with a single centre Belisha Beacon (either with or without a creamy white [steady] light above) and crossings with twin Belisha Beacons per direction. This composite image shows some of these possibilities which are more fully explored on the dedicated Zebra Crossing page. To improve the chances of vehicle drivers seeing the crossing and / or the pedestrians waiting to cross during the hours of darkness some Zebra crossings feature additional lighting. 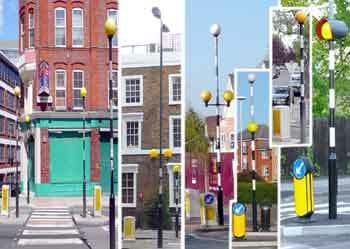 Variations on this include illuminating the Belisha Beacon poles left and using the same pole to carry both the Belisha Beacon and additional lighting. 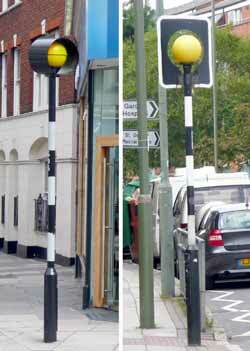 The composite image on the right shows two different ways in which this can be arranged - ie: either on a side support which branches off the main support pole or buy having the Belisha Beacon wrap around the sides of the support pole..
A variant on the traditional flashing globe is to have non-illuminated globes around which a ring of yellow LED's (Light Emitting Diodes) flash. 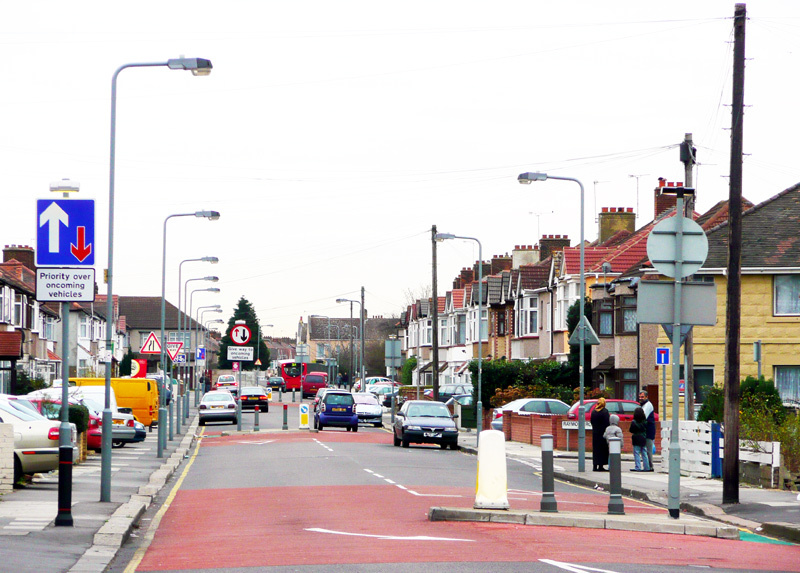 Some Belisha Beacons are fitted with light shades, either to improve vehicle drivers' visibility of the flashing light or prevent the flashing lights from being visible from nearby (typically residential) buildings where the stray light constitutes a nuisance. Whilst Zebra crossings are the only uncontrolled official 'at grade' pedestrian crossing points on Britains' roads, there are also locations where small pedestrian islands (central refuges) are used to split up a carriageway so as to create half-way 'safe havens'. 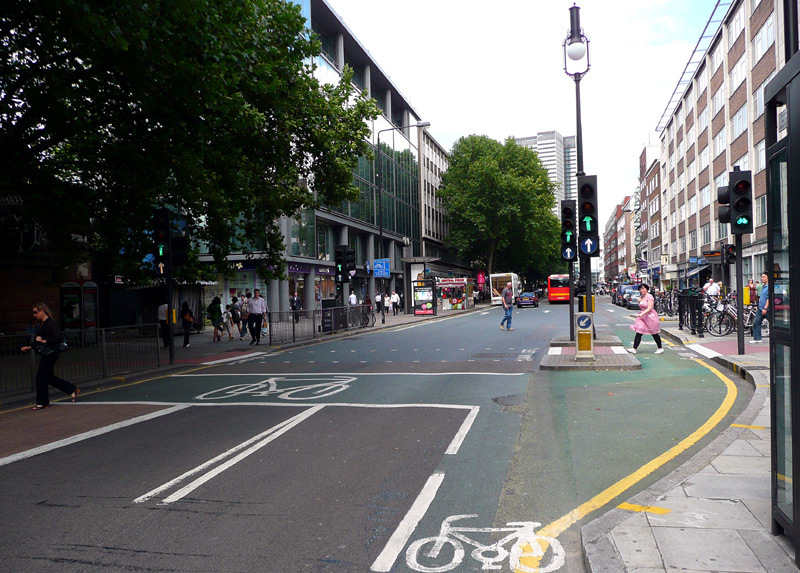 These 'splitter islands' are beneficial because they split the opposite traffic flows so that pedestrians can cross the road in two (usually easier) stages. 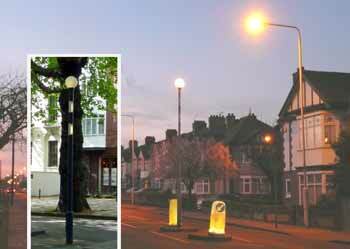 These crossings, which do not have names, can be identified by their single Belisha Beacon style lamp with two white stripes near the top and which at night (sometimes even during the day) is illuminated with a steady creamy-white light (as seen in the twilight image). As the inset shows, sometimes the twin white stripes below the lamp are also illuminated. 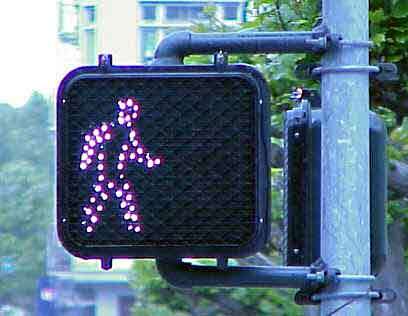 Pedestrians using these crossings do not have any automatic right of way. Despite being semi-official crossings they often feature facilities for people who have 'special needs' such as dropped kerbs (for people who use wheelchairs, pushchairs, etc.,), and tactile footpaths (on their approach) - for people with less than 20/20 vision. 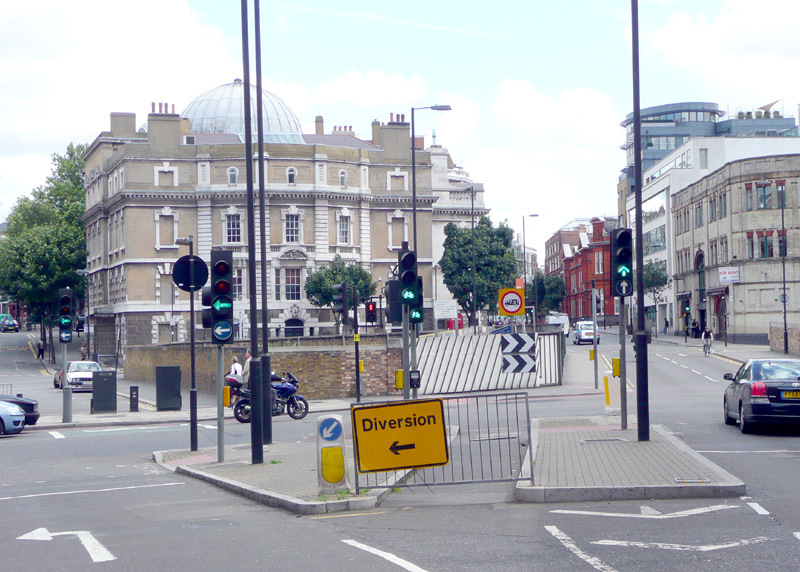 Because of the conflicts described above the early 1960's saw trials with modified types of crossings where the pedestrians would need to press a button to activate signals which would stop the traffic for them. The first type of these crossings were known as Panda crossings. Panda crossings featured a distinctive black & white triangular design painted road surface plus traditional black and white striped poles equipped with pedestrian call button units, a 'wait' indication which would illuminate when the button had been pressed, and traffic signals above which was a Belisha Beacon with horizontal black stripes. To avoid legal issues pertaining to pedestrians still having the right of way Panda crossings only had indications telling pedestrians when they may cross, and not when they may not cross. Pandas were not actually the first signal controlled pedestrian crossings in Britain, as such devices had existed since 1929. Their use however was not encouraged by the Ministry of Transport to whom the idea that traffic might be needlessly stopped at a red light was unthinkable, and that either Zebra crossings (which would let pedestrians cross with minimal delay to other road users) should be used or where crossing the road would be too disruptive or too difficult it would be better to install a footbridge or an underpass. The Ministry of Transport's concerns also extended to the potential high cost of installing full traffic-signal style pedestrian crossings. "A remarkably large number of (presumably) otherwise normal people appear to take great pleasure in pressing the button that operates the lights, even though it is quite unnecessary to do so." "Women are the main offenders when it comes to pressing the button without checking whether it is necessary. A few seconds later the approaching traffic is brought to a sudden halt - but by that time the cause of the hold-up is safely across and is gazing into a shop window, blissfully unaware of the inconvenience she has caused." This is a scenario which in later years an attempt would be made to solve, albeit it seems with only partial success. The light sequencing used for Panda crossings comprised of a logical but ultimately confusing combination of pulsating and flashing amber and red aspects advising road users when to stop and when they may continue if safe to do so, plus for the pedestrians an illuminated 'wait' indication that was located on the Belisha Beacon pole (near to the push button) which when it was time to cross was extinguished in favour of a flashing white coloured word 'CROSS' (located on the traffic signal head on the other side of the road) which speeded up its rate of flashing as time shortened. When not activated all the lights would remain off. 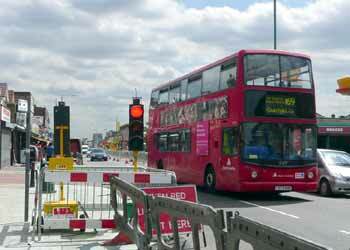 There was also a measured pause period between crossings which was designed to help keep traffic flowing. Right from their introduction these crossings were seen in an unfavourable light, with one of the first people to use one of the new crossings after its inauguration describing them as being 'hairbrained'. For many reasons including electro-mechanical problems and the fact that a different format to normal traffic signals was used and causing confusion the second half of the 1960's saw all the Panda crossings being replaced by another experimental design of crossing. Controlled Crossing Area - Where It Was Illegal To Cross A Road. Also in the early 1960's there were trials at three locations where, for the first time, it became a punishable offence for pedestrians to cross a road anywhere except at a designated crossing place at a designated time. The significance of this is that there is an ancient rule of the road which says that no particular road user has a priority over any other user, and therefore despite some signals already doing this it was not legally allowed to tell people who travel by foot to give precedence to people who travel in motor vehicles. The reasoning behind this experiment was the growing number of pedestrians trying to cross roads by just walking out in front of moving traffic and in the process getting themselves killed or injured. It should be bourne in mind that this was an era when the introduction of the motorways had proven that it was possible to segregate higher speed long distance traffic from local traffic, and ban pedestrians from the fast roads, so it was felt that road safety would be enhanced if busy urban streets also saw segregation between pedestrians and the traffic. The new regime lasted for a period of one year during which between the hours of 7am and 7pm (07.00 & 19.00) it was simply not allowed to cross the thick red lines which had been painted alongside the kerbside edge of the footpath. In addition to special signs (which used a logo of a 'stick' man) at the start and end of the controlled areas there were repeater signs approximately every 40 yards and a dedicated task force of police constables enforcing the regulations and giving out £20 fines to pedestrians who broke the rules. Pedestrian traffic signals were located every hundred yards, for the first time these traffic signals were legally allowed to tell pedestrians when not to cross. 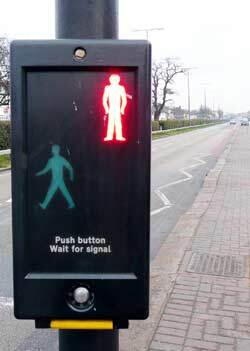 This came in the form of a white neon stick man standing still, the same stick man also advised pedestrians when it was safe to cross (he started 'walking') and when the pedestrian phase was ending (he started 'running'!) 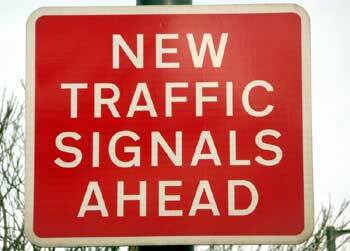 To minimise traffic congestion the signals worked on a 'green wave' basis, so that traffic would not be stopped at each crossing in succession. These signals marked the first time a Ministry Of Transport sponsored design of pedestrian crossing included a 'do not cross' indication, this being in the form of a red man symbol. For road users an even more radical innovation was that unlike normal traffic signals which feature a steady green lamp to advise them that they have the right of way there was a white cross. The new signals were known as an 'X-way'. It had been hoped that they would be known as 'crossways', to join the terms roadway, motorway, etc. However because the name was written with a letter X so most people referred to them as 'ex-crossings' (or something similar) - which perhaps was a very appropriate term because they did not last very long! In most respects the experimental X-ways were deemed to be successful, and in modified form exist to this day. The primary changes when they switched from 'experimental' to 'production' mode were the replacement of the white X with a normal traffic signal style green lamp, changes in the timing of the lights (so that pedestrians have a longer period of 'green man' before it started to flash) and the return to animal based name. 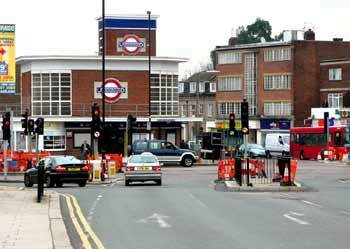 The new crossings were named 'Pelican' crossings. The word 'Pelican' actually means 'Pedestrian Light Controlled', with the 'o' changed to an 'a' so it has the same spelling as the bird. When launched (in 1969) they were promoted as being something brand new, although in reality they were only really modern versions of the traffic-signal style crossings which had existed in some towns and cities since 1929 and which also featured a conventional set of signals for the traffic and a two-light signal for pedestrians. Nowadays Pelican crossings are slowly falling out of favour as transport planners often see several other breeds of crossings as being more desirable. On dual carriageways the crossings would normally be staggered and are treated as two totally independent crossings. 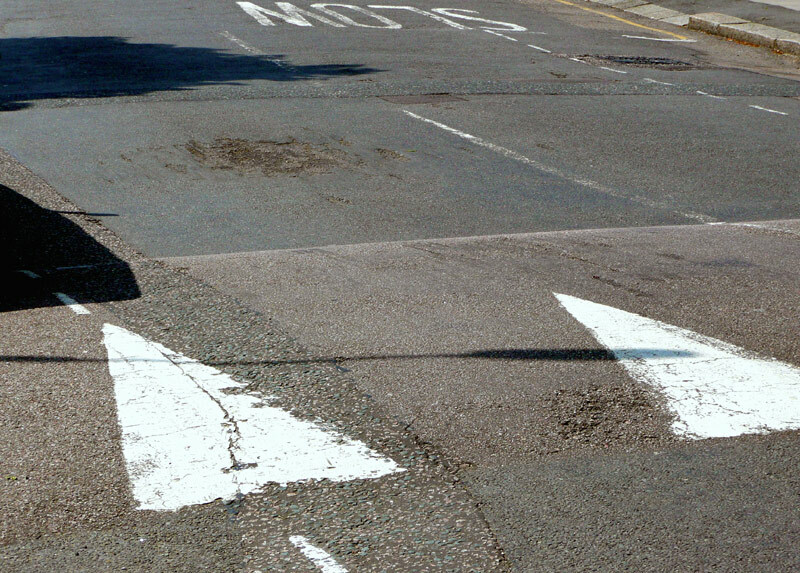 For safety reasons crossings which are located on dual carriageways often do not feature audible 'cross now' alerts, as these could mislead blind pedestrians in to crossing one carriageway when in fact it is the signals on the other carriageway which have changed. Alternative options which would be safe to use include tactile / vibrating indicators. A comparison between push button call units for traffic signals and pelican crossings (which feature farside type pedestrian signals). For pelican crossings there is an extra instruction in the lower panel which advises against starting to cross the road when the green man symbol is flashing. The white word 'wait' illuminates when the call button is pressed and switches off when the signals change in the pedestrians' favour. At many locations Pelican crossings are being replaced with Puffin crossings. As with Pelican crossings their name has a logical sequence of words behind it, this being Pedestrian User-Friendly Intelligent Crossing, albeit with an extra letter 'f' added to correct the spelling. Puffins were designed to act as a logical advancement on Pelicans, incorporating new technologies which were felt to be desirable to improve road and pedestrian friendliness and safety, as well as being more 'inclusive' for people with special needs. Whereas with the older style of crossings the green & red man symbols which the pedestrians waiting to cross the road need to watch to see when it is safe to do so are situated on the far side of the road - which may not always be easy for people with restricted eyesight to see - so with Puffin crossings these pedestrian lights are located on the same side of the road as the pedestrian, on the same pole as the pushbutton unit, and on the right-hand side of the crossing so that to see them the pedestrians will also be facing oncoming traffic. This is supposed to increase safety by encouraging pedestrians to watch approaching traffic and the pedestrian signal simultaneously. It is also said to reduce intimidation from drivers, which is a somewhat curious comment that probably comes from someone who always waits for approaching traffic to stop, no matter how far away it is, and then fails to understand that by failing to cross when the traffic signal told them to do so they have missed their allocated time-slot - as the traffic signal control unit will have assumed that they did not intend to cross the road and started to change back in favour of the road traffic. At some locations there will be additional poles with ancillary push-button units and indicator lights on the left-hand side of the crossing. On one-way roads and central islands of dual-carriageways the main push button units are still always located on the side from which the traffic is approaching. Another innovation is that Puffin crossings use overhead infra red / microwave / video imaging detectors and pressure pads to detect pedestrians and traffic flows and control the length of crossing time available to pedestrians, so that people who for whatever reason walk slowly or when large numbers of people are crossing the road so more time is given than compared to the time given to a single person who scurries across hurriedly. This facility replaces the flashing amber / 'green man' phase of the Pelican, during which time road users were allowed to process if the crossing was clear. 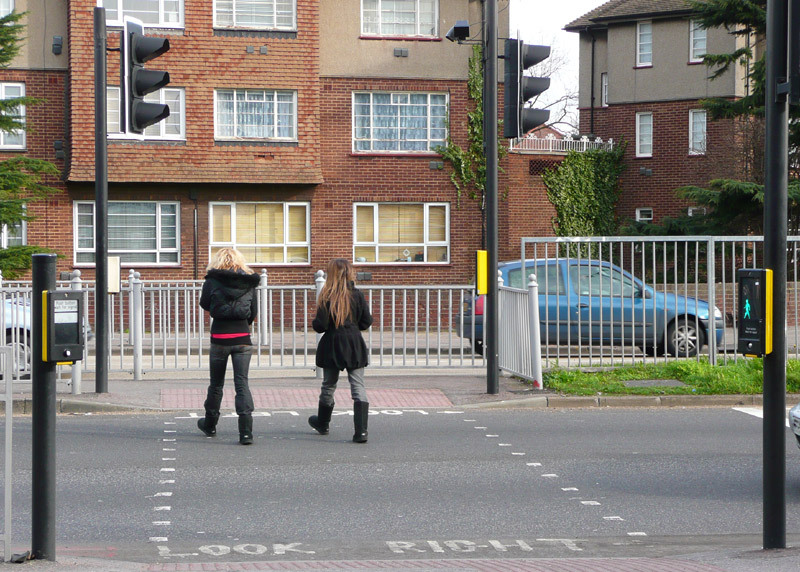 In addition, in order to reduce delays to the people travelling in road vehicles Puffin crossings use kerbside detectors which detect when a pedestrian has pressed the button on the demand unit to cross, but subsequently either decides not to cross and walks away or finds an opportunity to cross before the green pedestrian phase, in which cases the call for a pedestrian phase is cancelled. Puffin crossings introduced 'nearside' push button call units which are supposed to be located so that the pedestrians using it can also see if there is any approaching traffic - but are of no benefit to pedestrians once they have started to cross the road. 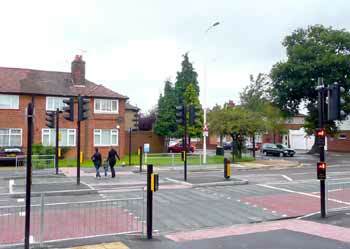 In some areas ordinary traffic signal controlled crossings also use (similar) nearside indicators for the pedestrians. Left: Overview of a Puffin crossing on one side of a dual carriageway, showing the Puffin call unit (with 'green man' illuminated) on the side from which the traffic approaches and more a traditional ancillary call unit on the other side. The latter has the words "Push button. Wait for signal". 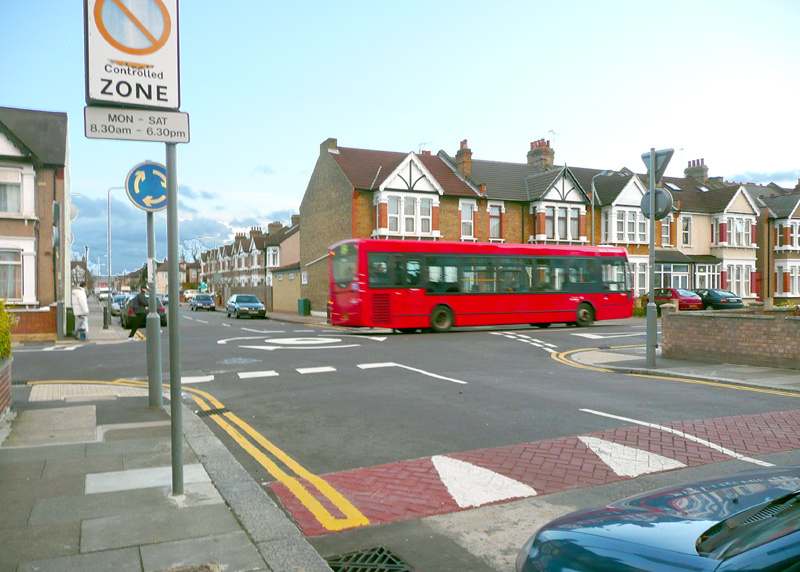 Note the complete lack of 'cross now' or 'wait' indications on the far side of the road, the white painted squares which delineate the crossing itself, the 'LOOK RIGHT' gutter marking and that on the central island the main push button unit is still on the side from which the traffic is approaching, even though for waiting pedestrians this is now the left-hand side of the crossing. Right: On one way streets and dual carriageways the gutter markings on 'right-hand side' of the road (relative to traffic direction) show 'LOOK LEFT'. Also note the more traditional metal studs, in contrast to the white painted squares seen in the other image. Toucan Crossings. 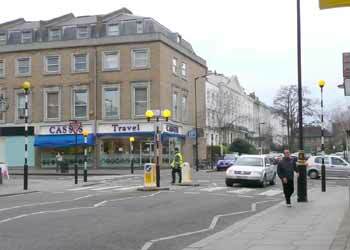 A Toucan Crossing is a speciality crossing which caters for cyclists as well as pedestrians. The choice of name neatly reflects the crossing's intended purpose, this being that 'two-can cross'. The significance of this is that unlike other crossings where the law requires that cyclists dismount and walk across the road (not that they ever do!) at Toucan's the cyclists are allowed to ride across. Sometimes Toucans are extra wide so that independent crossing lanes can be provided for the cyclists and the pedestrians, and sometimes they share the same crossing lane. Toucans come in either Pelican or Puffin format (ie: with either the pedestrian & cycle lights on the far side of the road or next to the 'call' button on the same side of the road as the pedestrian / cyclist). However, as with Puffins they do not feature the flashing amber / 'green man' phase. At Toucan crossings the red pedestrian and cycle signals are advisory and if it is safe one may cross even when it is red (which of course is what most people already do at all road crossings). At Toucan crossings the pedestrians and cyclists sometimes benefit from dedicated road crossing lanes, other times they share the same lane. Because of this their 'call' pushbutton units will vary too. 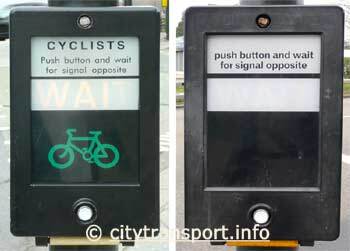 The examples seen here include a cycle-only version complete with cycle pictograms and a shared version where the 'call' button units feature blank panels. 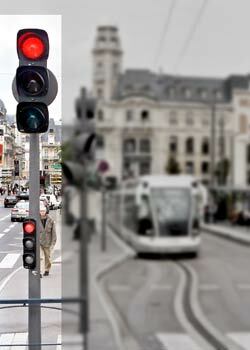 Both types of call unit would be used at locations where there are 'farside' pedestrian signals. The image on the right comes from the entry to a traffic signal controlled roundabout, however the principle is the same as with dedicated pedestrian / cyclist crossings. Farside type signal indicators at a Toucan crossing. 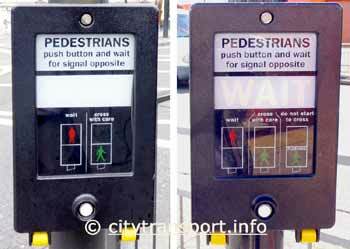 Nearside type push button call unit at a Toucan crossing showing both pedestrian and cyclist pictograms. The ring of red lights around the push button signal illuminate when the button has been pressed and signify that the crossing will change shortly (eventually). 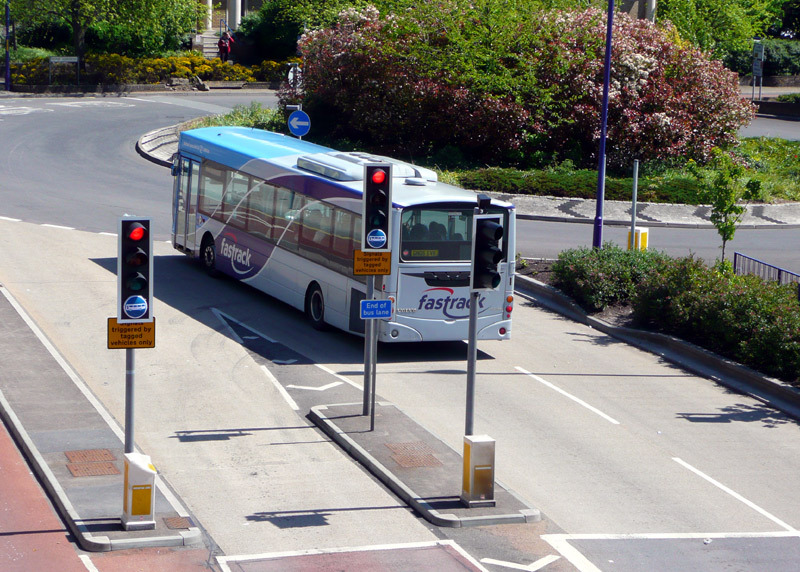 Some crossings feature two sets of indicator units on the poles - with them being at the correct height for a person in a wheelchair and an adult. However a closer inspection revealed that only the lower unit actually has a 'call' push button, the upper unit has this position blanked out. This crossing also features extra pedestrian indicators on the traffic islands, although one of these seemed to be temperamental and did not always illuminate. Perhaps everything was not working properly but the extra call buttons on the left of the crossing also did not seem to 'do' anything / maybe they are just meant to be cosmetic - certainly nothing lit up, neither when pressing the call button on it nor on any other call button unit. This crossing was noted as taking so long to change that most pedestrians were able to find a gap in the traffic and cross the road before the signals changed in their favour. This resulted in the automatic pedestrian detection system cancelling the 'call' - something which is supposed to happen when there is no-one waiting any longer. When activated this crossing makes a 'bleep' noise to advise people with less than 20/20 vision that it is now time to cross the road. What local residents think of this audible signal (especially at 3am in the morning) can only be imagined. Note that even though this crossing has some traffic with islands it is still a single crossing, so pedestrians are expected to cross it all in one go - unlike zebra crossings where the presence of a traffic island makes it into two separate crossings. Pegasus Crossings. A Pegasus Crossing is a speciality crossing which caters for equestrians as well as pedestrians. The choice of name neatly reflects the crossing's intended purpose, this being that of Pegasus, the winged horse. 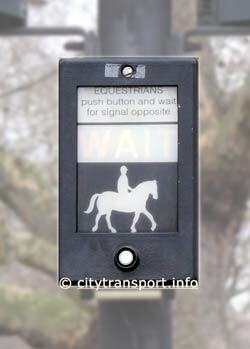 Pegasus crossing 'call' pushbutton units include a pictogram of a horse with rider. These are often located higher above the ground at a level which is easier for the equestrians to reach. 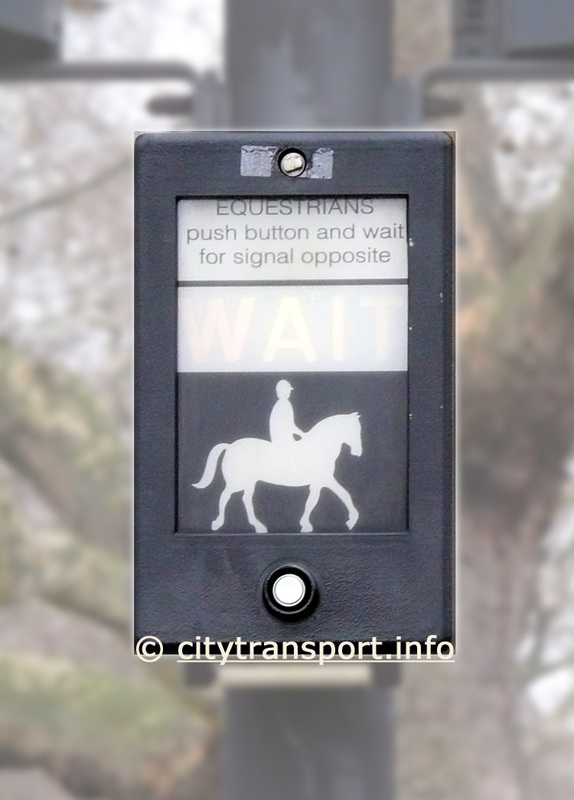 The green 'cross now' and red 'wait' symbols include those of a horse with rider - and cyclist. Certainly at this crossing there were separate signals for pedestrians, these being similar to those normally found at road junctions which have traffic signals. Tiger Crossings. Under current law a pedestrian crossing is just that, ie: for pedestrians. Cyclists are required to dismount (not that many do) and wheel their bikes across. 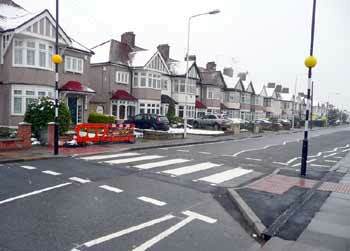 Tiger crossings are modified variants of zebra crossings where cyclists are allowed to ride across. They comprise of yellow and black stripes on the road surface, so they somewhat resemble the stripes on a tiger, which probably helps explains the name. So far it seems that only one Tiger Crossing has ever existed, this being in Aylesbury, Buckinghamshire and around 2005 - 7. It has now been replaced with a Toucan crossing. Are Puffins & Other 'Nearside-Only' Crossings Dangerous? 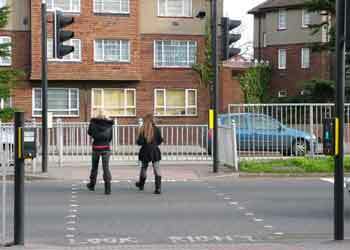 Whilst researching the different types of pedestrian crossings some of the information which came up on web searches talked of apparent dangers which it seems are mainly related to the location of the pedestrian signals advising when it is safe to cross, and when road traffic has been given priority. i) The poles with the 'nearside' pedestrian signals are not always being located as intended (aka: 'properly') which makes watching both the signals and approaching traffic less than easy. It could be that sometimes this is because the crossings are located at locations where there is very limited footpath space, or on roads which are curved / have unusual configurations, so the locations of the signals have to be a compromise - for instance, it would not be acceptable to reduce the width of footpath so that a wheelchair could not pass. ii) The switch of the pedestrian signals from the traditional and well-known farside of the crossing to the nearside is creating confusion, which in the most extreme situations has resulted in pedestrians not being able to find their signals and therefore not even bothering to press the 'call' button - and instead just dodging the moving traffic. Whilst this is not at all illegal it is potentially dangerous. 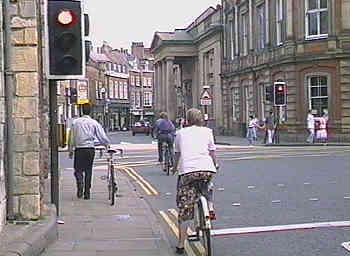 iii) The lack of farside indicators means that at busy locations where there is a number of pedestrians waiting to cross the road the pedestrians close to the nearside signal will be blocking the view of everyone else, so they will not be able to see any indication of when it is safe to start crossing the road. iv) The lack of a signal that is visible to pedestrians actually crossing the road does not inspire confidence. When crossing roads at signal controlled locations the pedestrians still like seeing an illuminated sign conforming that they have the right of way / the traffic signals are still working, which is not possible if the only signals are out of sight on the footpath. Perhaps a logical conclusion to solve the issues raised in point No. ii) above would be for Puffins to have both nearside and farside signals advising pedestrians when it is safe to cross. After all, with farside signals being a tried and tested way of doing things which has existed since the late 1920's (plus accepted practise in so many countries overseas too) so it is hardly surprising that the introduction of a type of crossing which is different (because it requires pedestrians to look somewhere new and unfamiliar) has lead to potentially dangerous confusion. The Panda Crossings were also 'different' in ways which created confusion - and were very quickly replaced with modified crossings which stood the test of time. Maybe history should repeat itself? (Some) Puffins & Toucans Are GNAT's In Disguise? Why 'GNAT'? Since (in Britain) most of the types of designated pedestrian road crossings are named after animals it seems appropriate to name pedestrian controlled traffic signals which create traffic congestion after an animal too. The name 'GNAT' is eminently suitable for this, as it shares some attributes with the other types of controlled crossings (as described above) in being both an acronym - in this case for 'General Nuisance All Traffic' - and a real animal, albeit one which people find unwelcome and unpleasant! A dictionary described gnats as "various kinds of small biting flies". Well, in theory this should not be. But, alas, it seems that some Puffin and (especially) many Toucan crossings are either malfunctioning - or have been incorrectly set-up - in which case it can be assumed that there are a LOT of poorly trained signal installation engineers who desperately need retraining - and should not be allowed to continue working until this has been accomplished. 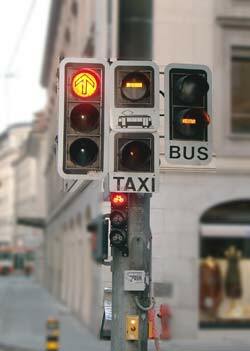 These signals are supposed to detect when pedestrian(s) are crossing the road, and if there is a large group or the person is walking slowly then the computer system will give them extra time to cross the road by delaying the change back to green for the road traffic. For elderly and otherwise infirm / disabled pedestrians this is seen to be a much more equitable mode of operation than the situation with Pelican crossings, which after a pre-set number of seconds will change to flashing amber irrespective of how quickly (or otherwise) they are walking across the road. Instead many of these pedestrian controlled signals seem to hold the traffic for as much as a further ten (10) seconds after the pedestrians have crossed, needlessly adding to traffic congestion, air pollution, etc. It also aggravates vehicle drivers, this being something that ultimately can be seen as a contributory factor in 'road rage'. This is what makes them GNAT's! The cause seems to be that the 'variable clearance' period which detects when pedestrians are crossing is not working... so the signals default to staying on red for the maximum permitted time after the pedestrians have crossed. This explains why it is being suggested that either they are malfunctioning or have been incorrectly configured upon installation. Another issue relates to the length of time they take after the 'call' button has been pressed before they change in favour of the pedestrians. Although this has not been timed on a stopwatch the impression gained is that it can be as much as a minute, which also seems to be excessive. Both pedestrians and road users have equal rights to use the same section of roadway, and there is a need for a balance which respects those rights without (as far as possible) being disadvantageous to the others. The signals seen in the youtube clip detailed below fall foul of this, and could even be said to suffer from a split personality. At normal times they too keep pedestrians waiting - but in the rush hours they change in favour of pedestrians *very quickly* after the call button has been pressed. 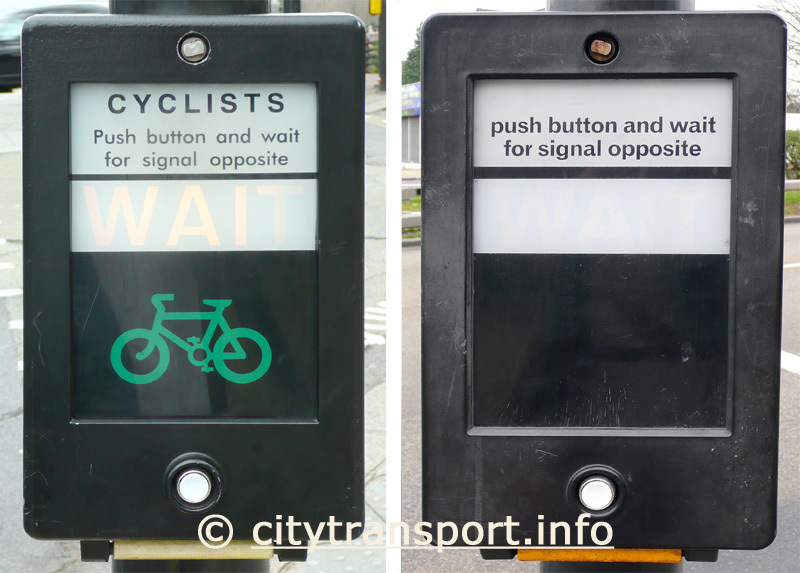 Problems arise however if the button is pressed (by more arriving pedestrians) towards the end of an activation cycle, as even though barely 3 vehicles (per lane) are able to pass them they will still change back in favour of the pedestrians almost immediately. In the most extreme instances (eg: morning rush hour) this can and does result in the entire section in front of them as far as the roundabout being empty, whilst behind them there is a 10-15 minute queue. In the evenings the same happens on the eastbound carriageway, with traffic sometimes tailing back to and even partially blocking the roundabout. Perhaps this is also a traffic detection issue, however even if it suggests a malfunction, of one sort or another. A 101 second video of a Toucan crossing demonstrating the long delay between the pedestrians crossing and then changing back to green for the road traffic has been placed on the ‘YouTube’ film / video website and can be watched (in a new window) by clicking either the projector icon or here - http://youtube.com/watch?v=dM3xF3Egm1A. Note that the three sequences shown were filmed with slightly different camera settings, which explains why the images are darker / lighter than each other - the 'default' setting was too dark, so different settings were tried, but the result was only discernable after the video had been downloaded to the computer. 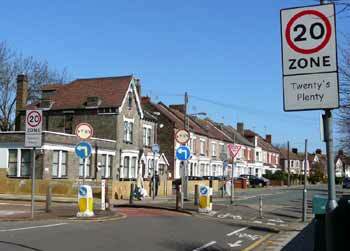 The phrase Traffic Calming is a generic term which refers to a collection of methodologies much loved by urban planners and traffic engineers that aim to slow down and / or reduce traffic levels. 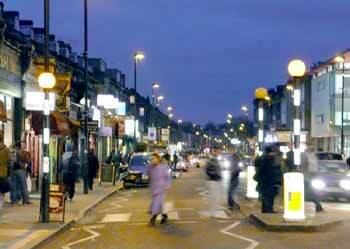 Often traffic is calmed with the publicised aim of increasing safety (either for road traffic, pedestrians, or both). However many vehicle drivers see the use of the phrase ' traffic calming' as an oxymoron and suggest that its real meaning is best understood as being 'driver annoying' with in the most extreme situations the result being 'road rage', as described elsewhere on this page. Sometimes traffic calming is the result of political motivation with the express aim of trying to force people out of their cars, with the above cited reasons just being used as 'window dressings' to make what is being done appear palatable, and even reasonable. 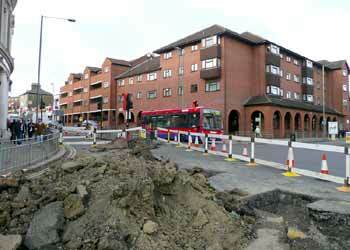 It is not unknown for even main roads to be 'calmed', even though this negatively affects bus services as well. It is very difficult to understand how making bus travel slower will make the buses appear attractive in a way that will entice people who drive to leave their cars at home and use the public transport instead. 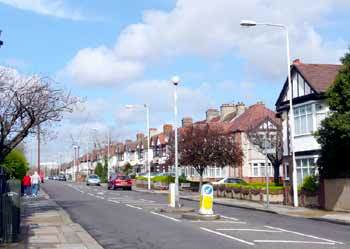 It should be noted that these comments do not apply to what are known as Home Zones which are roads or collections of roads where there is very little traffic with the layout of the footpaths and roadway being completely redesigned to create space for and to encourage outdoor living such as existed before the days of motor transport. Sometimes traffic management schemes will see the introduction of (often complex) one-way street systems designed to funnel road traffic through certain roads. It is not at all unusual for this to result in road users being prevented from easily reaching where they wish to go - or forced to drive a 'long way around' which is much further (in distance) than they would otherwise have needed to drive. Usually this will add to journey times and local air pollution too. The latter three involve creating small sections of road which are physically higher than the adjoining sections of road, with the express aim of making travelling over them uncomfortable, as this (it is hoped) will force the vehicle driver to travel over them at reduced speed. 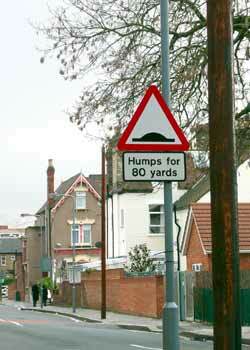 According to the Transport Research Laboratory (TRL) Report No.417 speed humps only work when they are uncomfortable. Despite being a legal requirement that road humps / cushions / tables are signposted, sometimes this is not done. Part of a complex one-way system designed to prevent road users from using local / residential roads as throughroutes. Note the 20mph speed limit signs, the 7' 6" (7ft 6in) width restriction and the provision for cyclists to pass the artificial island - although realism suggests that even without this provision they would still do as they please. Road humps sign plus indication of how far along the road they extend. In the distance a full-width hump can be seen rising up the side of the kerb. Speed humps (which are sometimes also known by the nickname of 'sleeping policemen') usually extend over virtually the entire width of the road whilst as a contrast speed cushions are typically between 1.3 metres and 1.9 metres in width. Usually there will be several speed cushions arranged across the width of the roadway with between two and four usually being sufficient for most roads. Narrow roads (or roads which also have footpath build-outs to reduce the width of the traffic lanes) may only have a single speed cushion. Also factors here will be the width of the speed cushions, the spacing between the speed cushions, the type of traffic expected and other criteria. To make life easier for cyclists Department for Transport guidelines suggest that there is a gap of at least 750mm (but preferably 1 metre) between the cushion and the kerbs. The guidelines also suggest that ideally the gaps between cushions should not exceed 1 - 1.2 metres. On roads which are served by buses they suggest locating the cushions so that the buses can straddle them, which means drive over them with all their road wheels remaining on the road surface, as this will help minimise discomfort to bus drivers and their passengers. For cars however the general idea is to force them to drive over the cushions with the wheels on at least one side actually travelling on the surface of the cushion. Speed tables are akin to flat humps which stretch out over a section of road. Often they are located at junctions, with the aim of reducing collisions by forcing all vehicles to travel very slowly at the specific location. Speed tables are also sometimes used in preference to speed humps to reduce the impact on long wheel base vehicles such as buses. A speed hump covering the full width of a road. A much more severe speed hump in a car parking area. 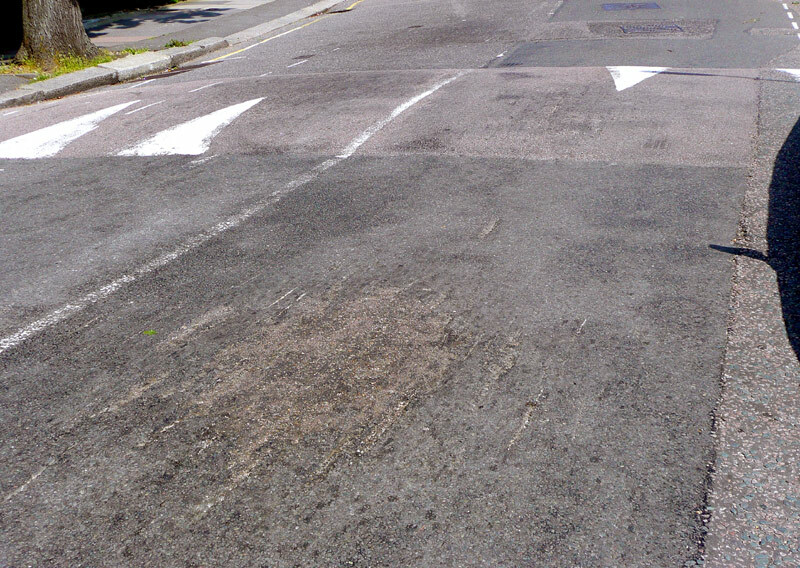 The right edge (without the yellow stripes) has been flattened to allow cyclists to pass more easily. A speed table on a one-way street which is also a bus route. To avoid interfering with rainwater drainage the gutter remains clear. 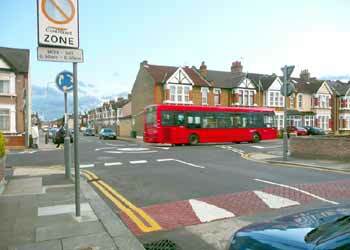 A speed table at a road junction in a residential area. The use of a 'mini' roundabout here further enforces reduced speeds because all road users are supposed to slow down and look before passing the junction. The damage to the road surface seen in these images is typical of poorly designed / installed speed humps, cushions and tables which cause the undersides of some vehicles (especially those with low ground clearance) to strike (or 'bottom-out' on) the road surface when passing over them. These images show damage from a full width speed hump. The damage is seen on the exit side of the hump and the road surface after the hump. Whilst the use of physical solutions which involve raising all or part of the road surface do seem to be successful in making roads unattractive and thereby (where there are alternative choices) reducing the numbers of vehicle which travel along them the increased use of physical solutions has not found favour with some of the people who work in the public transport, emergency service, medical, cycling and motoring industries. One reason why the motoring industry sees them as potentially creating a serious threat to road safety is because they can damage vehicles, especially their suspensions. 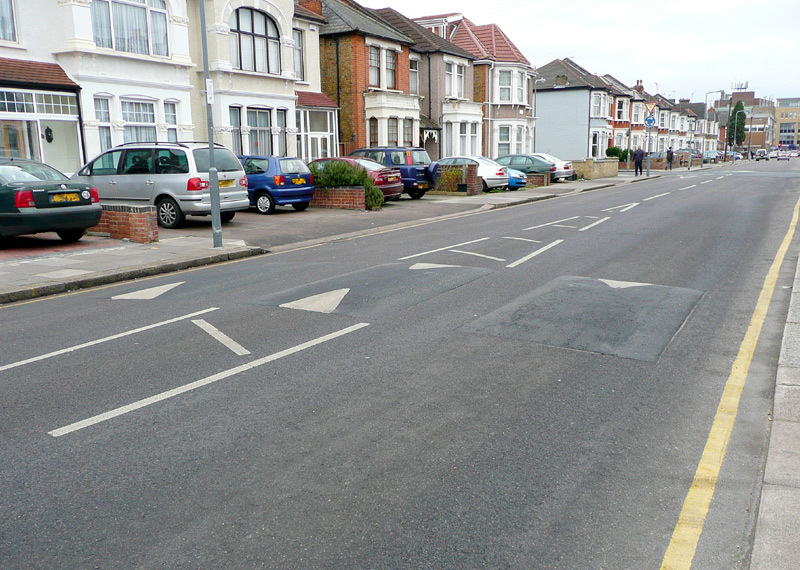 Even though there are legally prescribed limits on the dimensions of the road humps (which it seems are not always adhered to) it is claimed that the extra wear and tear damages vehicles (tyres, ball joints, springs, shock absorbers, misaligned wheel tracking, etc.,) resulting in an increased possibility of failure and - especially at high speeds - serious accident. Motorists also lose out financially when the damage results in MOT test failures, requiring expensive repairs. It is not unknown for parts of vehicles which have a very low ground clearance to strike the speed humps, even at very low speed eg: 10 mph. From personal experience this has been known to damage a vehicles' gearbox, although exhaust systems are also easily damaged in this way. It has been known for vehicle passengers to suffer serious and permanent spinal injury simply because the vehicle travelled over a speed hump. Whilst local residents are usually pleased with the reduced speeds it has been found that the constant slowing down before passing over the hump and acceleration afterwards increases noise and vibration levels, especially with large commercial vehicles. TRL report No. 482 found that in extreme cases there was also subsidence of the road and buildings alongside due to the ground pressure waves that are created. In some areas it has also been found that 'joy riders' driving stolen cars derive much pleasure by riding over them as quickly as they can, not caring that it destroys the vehicle they had stolen. Environmentally it has been found that in addition to the noise pollution detailed above the constant slowing down before passing over the hump and acceleration afterwards increases fuel consumption and air pollution. TRL report No. 482 found that the mean emission rates of CO, HC, NOx, and CO2 from petrol non-catalyst, petrol catalyst, and diesel cars increased by up to 60% following the introduction of traffic calming measures, with even higher numbers over more "severe" measures such as speed bumps. In addition the use of bumps and cushions seems to encourage the use of larger vehicles which are more polluting. This is probably because the human occupants find that negotiating hump-style traffic calming measures is less uncomfortable in the larger 'all terrain' vehicles. Cyclists see full width road humps and speed tables as just downright dangerous, with there having been instances of motor cyclists sustaining serious injury after being thrown from their bike and (especially pedal cyclists) trying to negotiate them at an angle and instead losing their balance and falling on to the road, sometimes in the path of oncoming traffic, with fatal results. 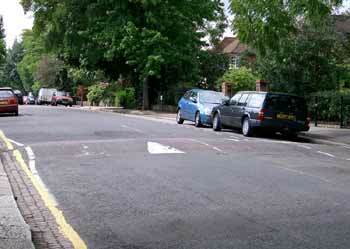 Speed cushions are usually less of an issue here, as the cyclist can ride on the flat road surface between the humps. 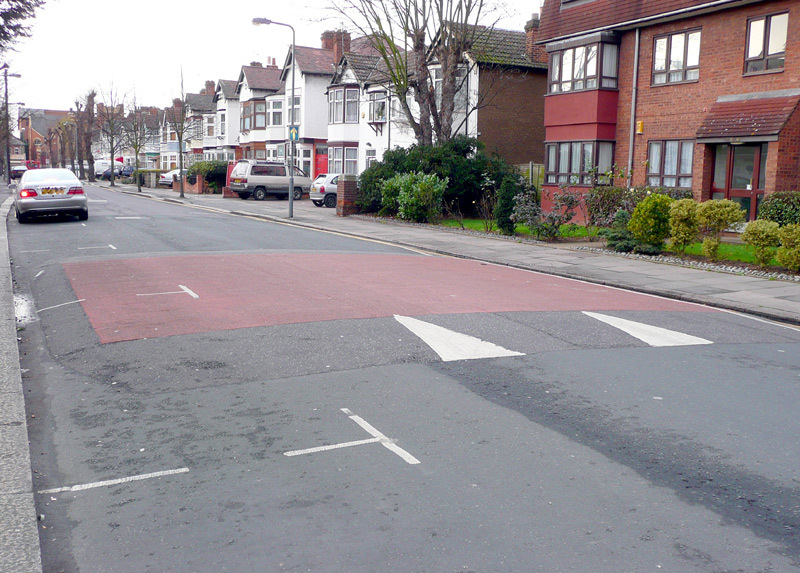 The emergency services object because full width road humps and speed tables increase their attendance times for emergency calls (potentially as much as 10 seconds per hump), thereby risking the lives and property of the people. The Chairman of the London Ambulance Service claimed that speed humps are killing hundreds of Londoners by delaying 999 crews, with more lost because of 'traffic calming. than the 'calming' actually saves. It is known that especially for heart attack patents even a minute in delay can be enough to make the difference between survival or otherwise. This is in addition to issues related to the increased wear and tear on vehicles. It is claimed that to minimise the risk of hump-induced back injuries some police officers prefer to avoid patrolling along roads with speed humps / cushions / tables of any sort. The ambulance service also objects because of the discomfort and possible injury that may be caused to their passengers, especially to patients with spinal injuries, who in some (thankfully rare) instances have been known to suffer severe and permanent disability (paralysis) as a direct result of travelling over a speed hump in an ambulance. In addition to the increased wear and tear on their vehicles which may be travelling over many speed humps every day bus companies dislike speed tables because of the injury risk to their drivers and passengers. It has been known for bus drivers to be so alarmed about the potential threat to their health that the introduction of speed humps along bus routes has lead to them going on strike, with in some cases the buses even being permanently diverted along different roads as a consequence. 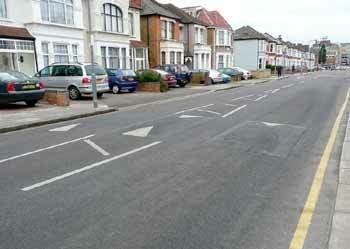 Speed humps are also blamed for making roads inaccessible for disabled people & hearses. Speed humps are also cited as creating additional road maintenance costs because after a couple of years the road surface before and after the hump tends to develop potholes. In addition to fully resurfacing the road it is often necessary to remove and replace the speed humps, which also adds to the cost even further. Some local government areas found that when studying the effects of speed humps on accident reduction they found that other solutions were more effective / would represent better ways to spend money. In the mid 2000's the London Borough of Barnet adopted a policy whereby as roads become scheduled for resurfacing they removed the humps on a permanent basis. At the time other London boroughs cried out in horror, but subsequent statistics have not supported those organisations which foresaw a deluge of accidents as a result of this policy. This road is a bus route and features several sets of chicanes plus road markings and signage to enforce single file traffic past them. As the road signs show, which vehicles have priority when passing the different chicanes varies depending upon direction of travel. 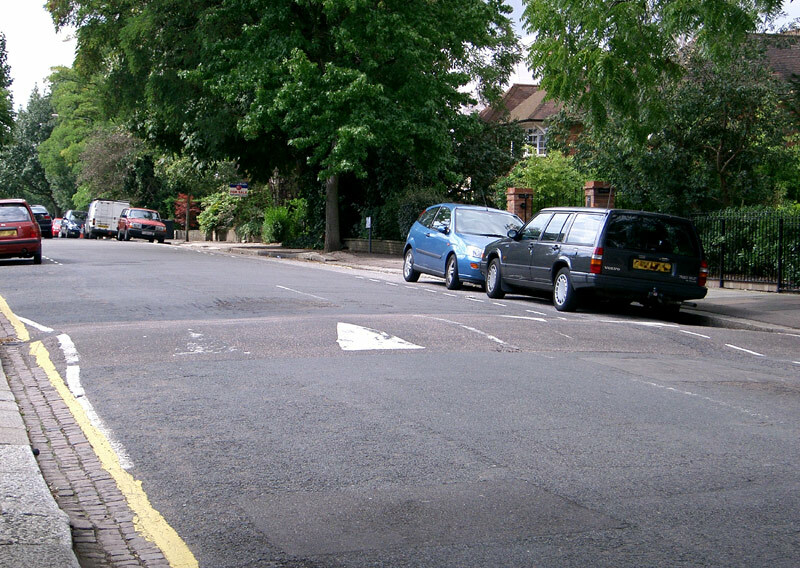 A bank of three narrow speed cushions on a residential road which is not a bus route. A single speed cushion in the centre of a two-way road were vehicles normally park on one side and used to park on the other side but the parking space has been closed as the householder has had a dropped kerb installed so that they can park a vehicle 'off street'. Elsewhere along this road there are parking restrictions and twin speed cushions are used (not shown). This bank of four speed cushions are in an area where the local council has a different transport policy and therefore even parked vehicles must straddle the speed cushions. Traffic calming and increased accidents. Apparently the law requires that speed humps are no more than 4 inches (10cm) high, clearly signposted and well lit. However its not just the height which is important, as it is the angle of the incline which often makes driving over them so uncomfortable and potentially hazardous. Many people believe that it should be possible to drive at 25mph in a hump-strewn 30mph zone, but fearing damaging their vehicles (and themselves) most people slow down to much lower speeds. Sometimes accidents occur near to speed humps / cushions / tables of any sort (and chicanes) caused by a driver braking sharply for the obstruction in the road when the following driver knows they can be safely negotiated without slowing down. When encountering speed cushions many people often chose to drive so that the cushions can be straddled by their wheels, which on wider roads where there are often three (or more) cushions will often result in them either driving very close to the kerb or down the centre of the road (this is also a primary cause of misaligned tracking and damage to tyre inside shoulders). Deviating off the sensible and natural line of the road in order to negotiate speed cushions (and chicanes) is sometimes blamed for creating conflict where none existed before, resulting in increased numbers of accidents - both with other vehicles and with cyclists. As an aside, driving so that the cushions can be straddled by the vehicle's wheels is the worst option for damaging the suspension and tracking, resulting in increased tyre wear, and worse. As previously stated, many people who suffer from medical conditions such as back problems (one of the most common medical complaints), recent abdominal surgery or other disabilities find that travelling over speed humps / cushions / tables of any sort can be extremely uncomfortable, even painful. 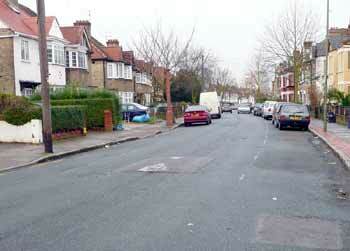 Some people suggest that any form of traffic calming scheme is missing the point. They suggest that roads are for vehicular traffic and put the blame for any accidents involving pedestrians solely on the pedestrian involved (it is not known what they think of drunk or drugged vehicle drivers). They also advocate that instead of making cars avoid pedestrians, measures should be taken to prevent pedestrians being on the road. 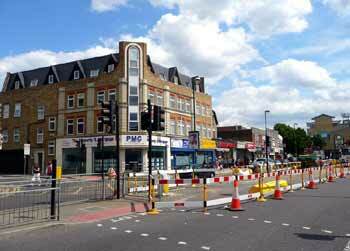 This could involve fences, footbridges and designated signalled crossings. They see many instances of traffic calming as being about as sensible as making trains stop at level crossings so as to allow the road vehicles to pass. 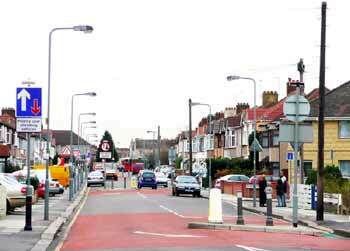 Other people suggest that for residential areas the most effective way to slow traffic is to remove the footpaths, pave the entire area in a way which does not create any specified areas for vehicles or pedestrians and impose a 20mph (30 km/h) speed limit. To a certain extent people's attitudes towards road transport will depend on whether they drive a car or otherwise. It could be said that people have a love / hate relationship with cars. Everyone who drives or who access to a close relative who drives will cherish the freedom they gain to travel where and when they choose. But hardly anyone truly likes the traffic congestion, and almost everyone actively dislikes the noise, smells, pollution, and danger which all too often result from road traffic. Especially fossil fuelled road traffic. It is said that when carrying out vehicle trials in order to gain information to use in report No. 614 a London taxi suffered serious damage in the speed-cushion tests, but this has been hushed up. Not having seen the report myself it is not possible to validate the truthfulness (or otherwise) of this information.